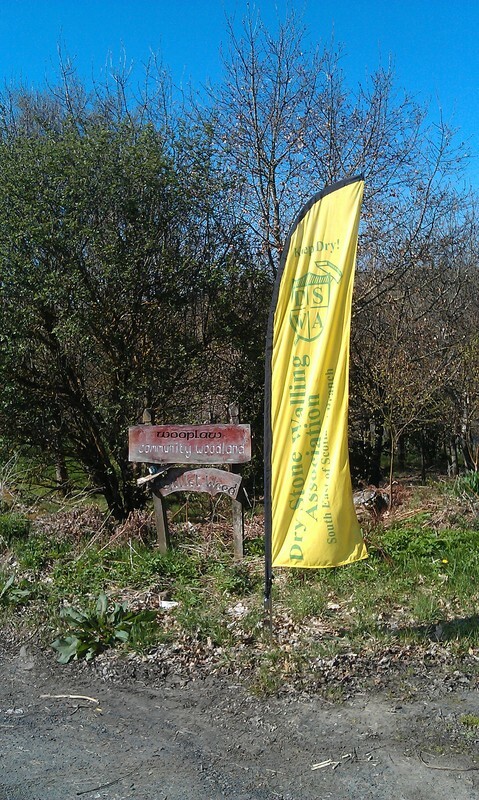 Today a few of us started the season with a return to Wooplaw Community Woodland, in the Borders (see numerous past blog posts). 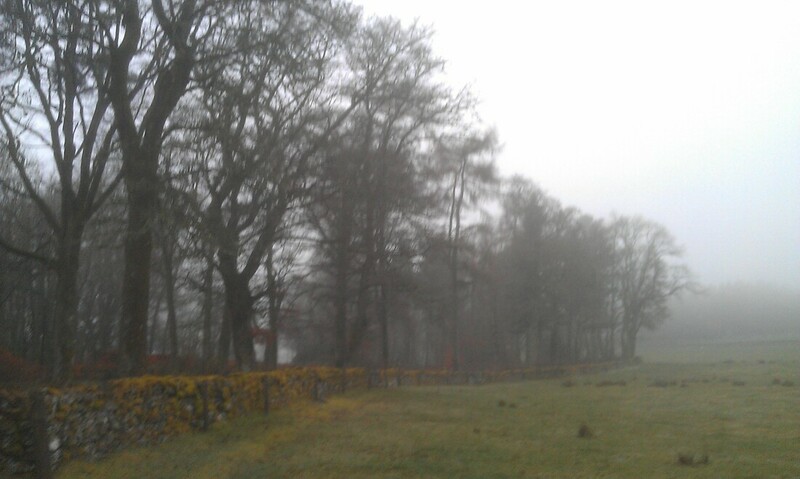 It was a pretty cold and damp day, though the rain had pretty much stopped by the time we arrived. 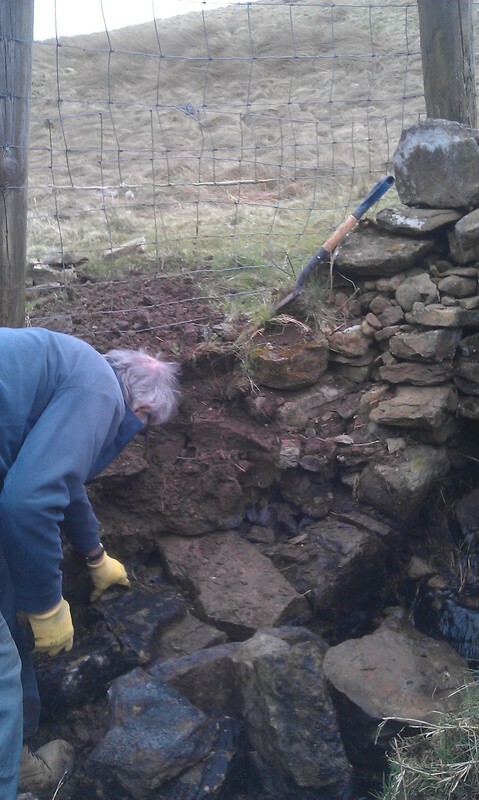 The field where we were working before now has bulls rather than horses in it, so we decided to do some work at the other end of the site, near the where the new cabin is being constructed to replace the old one which was burnt down by vandals last year. 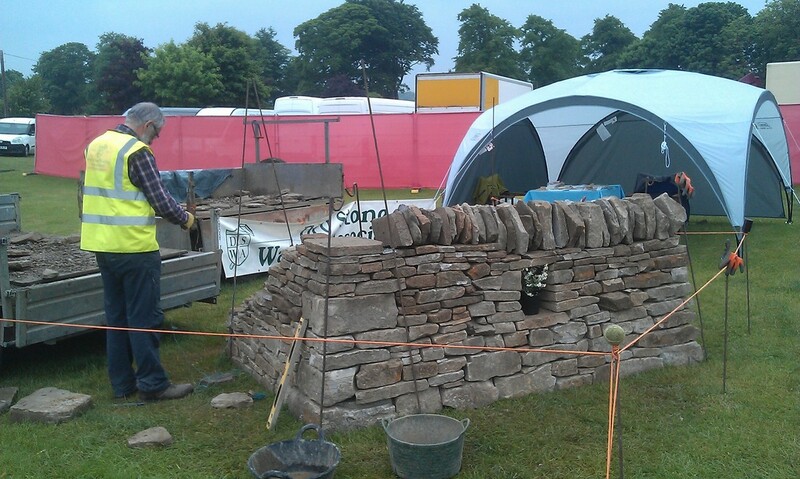 They're getting on pretty well with it, and have even made the walls of dry stone (sort of). 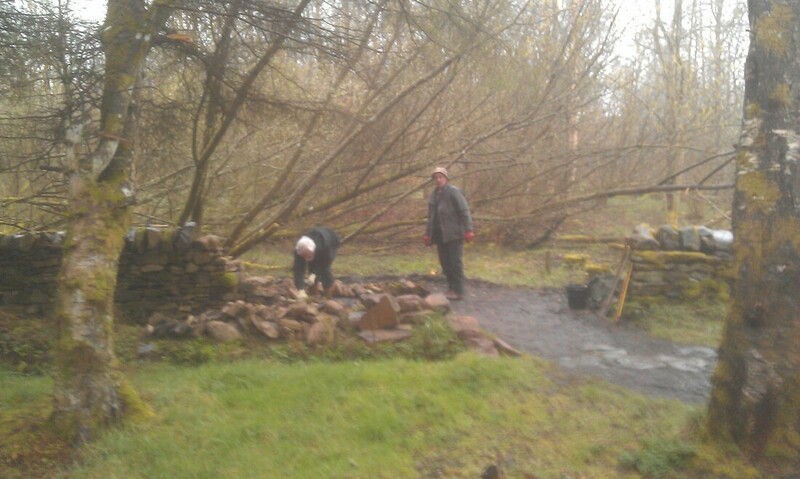 We bumped into Stephen in the car park, a branch member who is also involved in Wooplaw, and he informed us that during the work the cheekend near the cabin (which we had rebuilt before) had got knocked down. 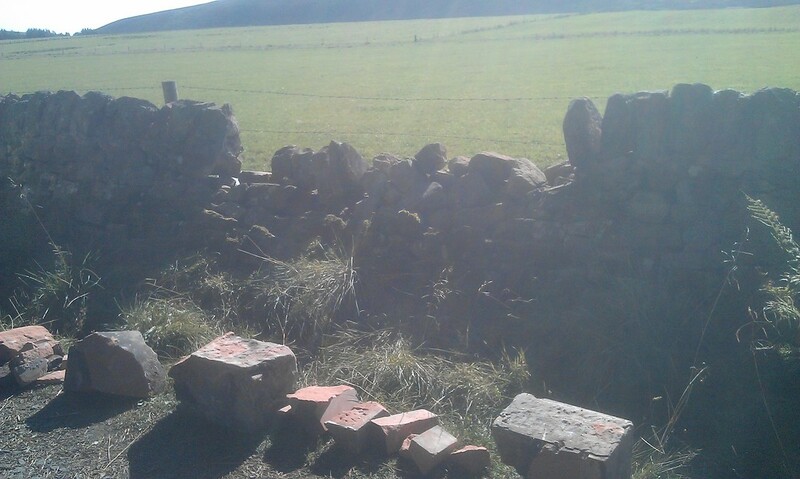 It's a bit of a tight turn, even for the wee tractor they have, so we decided to take down the end of the wall and rebuild it a bit further back. 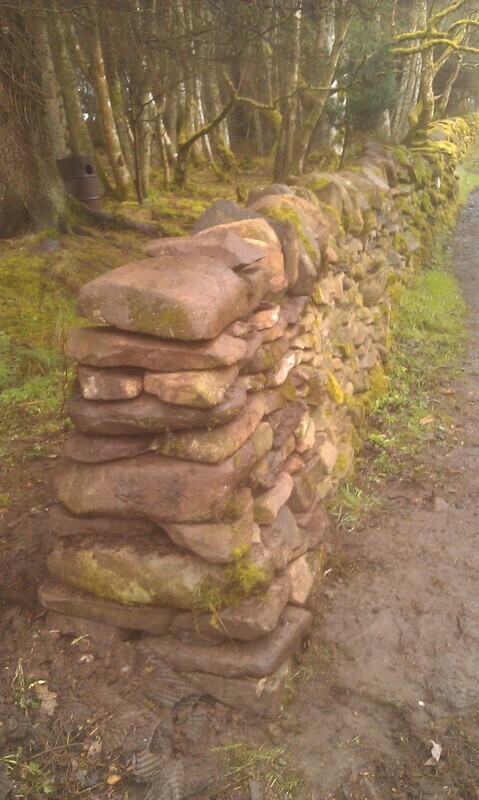 This did mean that we had quite a bit of work to do taking down the end four feet or so of wall, but at least it meant we had no shortage of stone to build with. 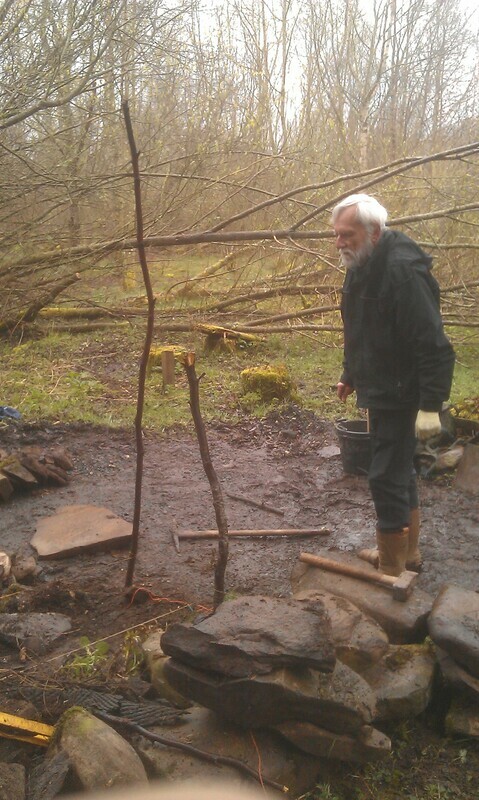 When we started rebuilding we found that we had no poles to attach the lines to, so we improvised with a couple of sticks. 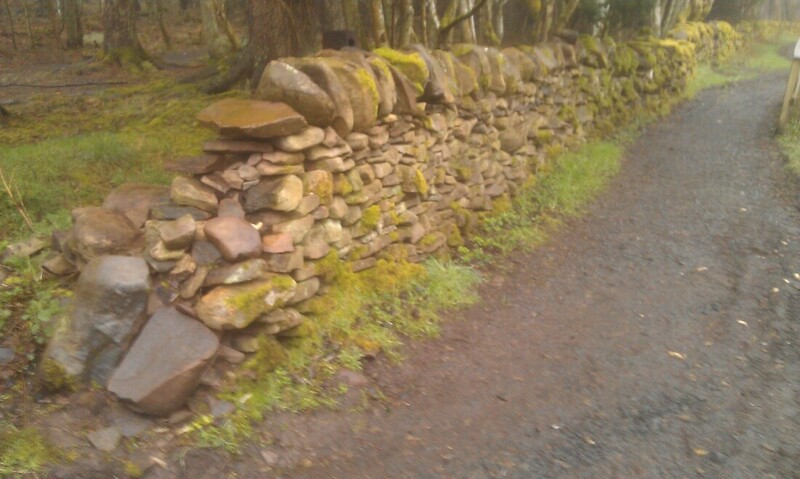 Not the straightest of guides, but perhaps in keeping with the existing, somewhat sinuous, wall. 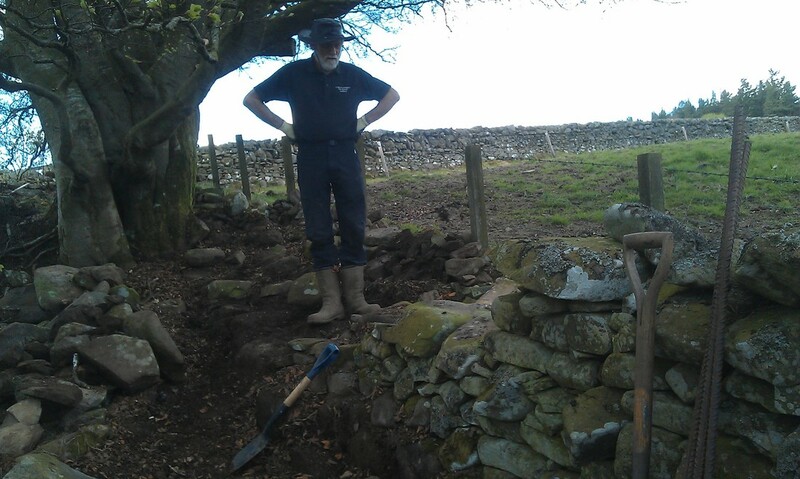 There wasn't really room for three people to work on building the cheekend, so Alan headed off a bit further down to where there was some remedial work required on another wall we'd previously repaired (the damage most likely caused by children using the rope swing, though, rather than tractors). Dave and I got the cheeked up to about through height before deciding it was time to break for lunch. 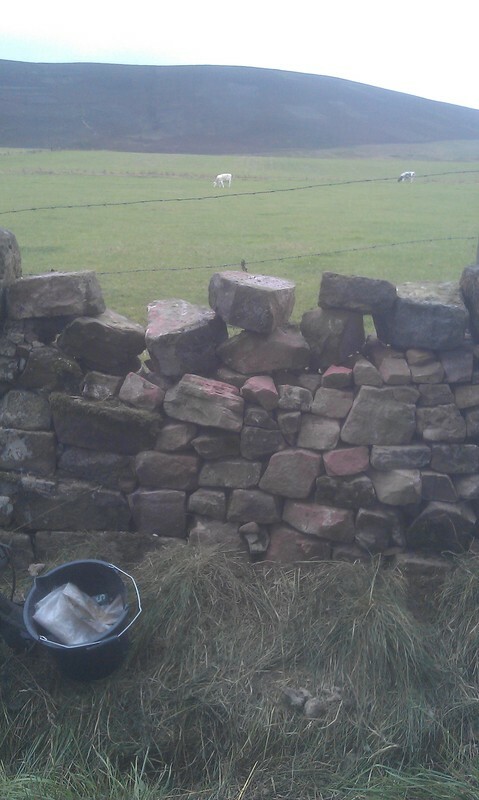 Meanwhile, Alan had finished repairing the other wall. 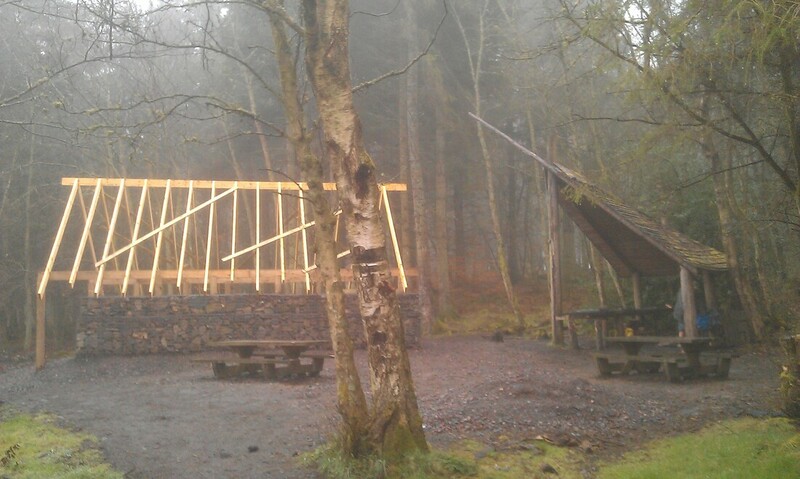 Fortunately the barbecue shelter hadn't been destroyed by the fire, so we were able to get out of the drizzle and drips from the trees to eat our lunch. 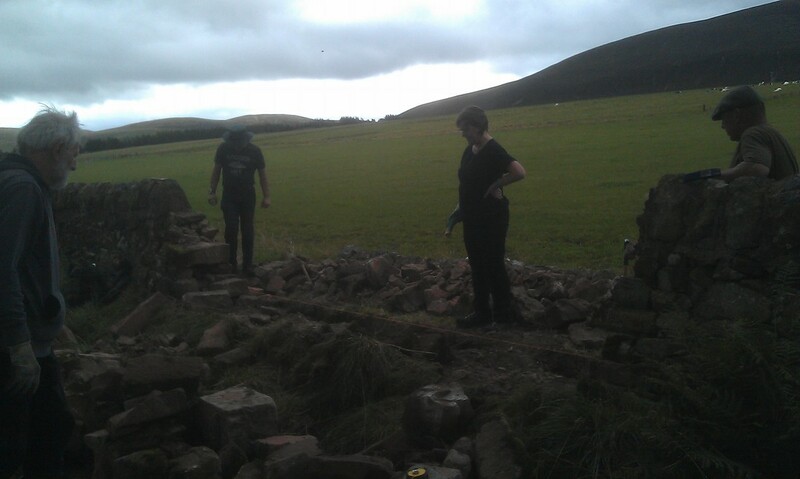 It was still pretty chilly though, and I think we were all pretty happy to get back to work. 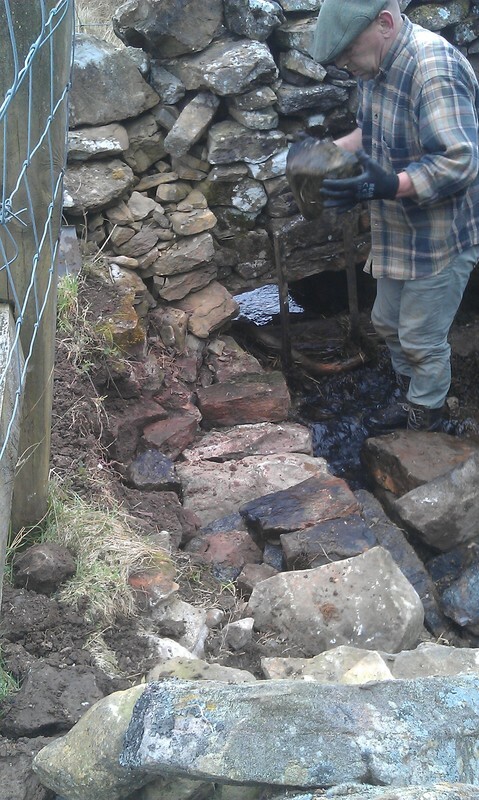 By about 2:30 we'd got the cheekend back up and had cleared away the unused stone from the path. 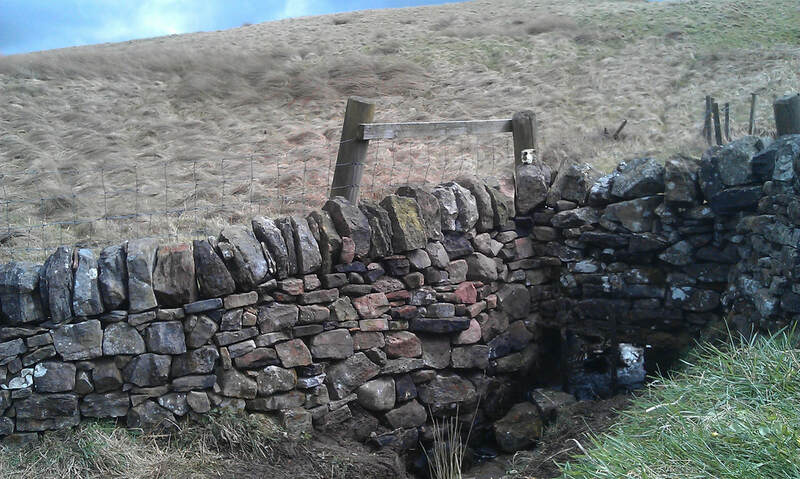 If it had been a warmer, dryer day we might have decided to tackle a few more wee repairs, but as it was we just decided to call it a day. Today was our last practical outing planned for 2018. 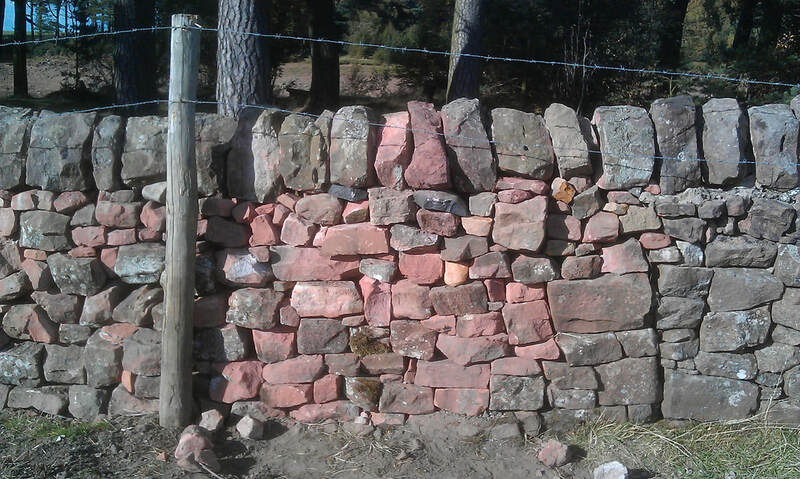 We had been intending to go to Queensferry to do some work in the community garden there, but they don't have the funding for the stone just now, which was a shame but also gave us a good opportunity to go back and finish the wall repair we started at Harlaw last month (see previous post). 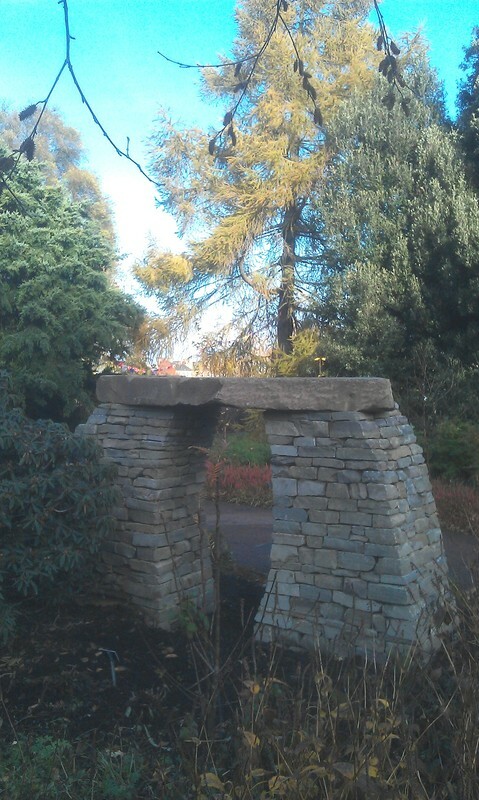 The park rangers had provided us with more stone, and the weather provided us with a bright but slightly chilly day - so, near-perfect dyking conditions. 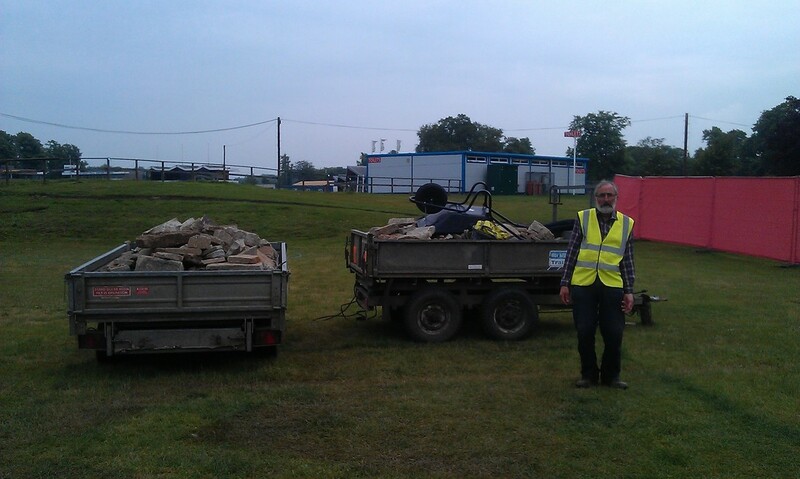 When I arrived at the site I found Dave already there, having taken down the roughly-piled copes we'd put up to fill the gap. 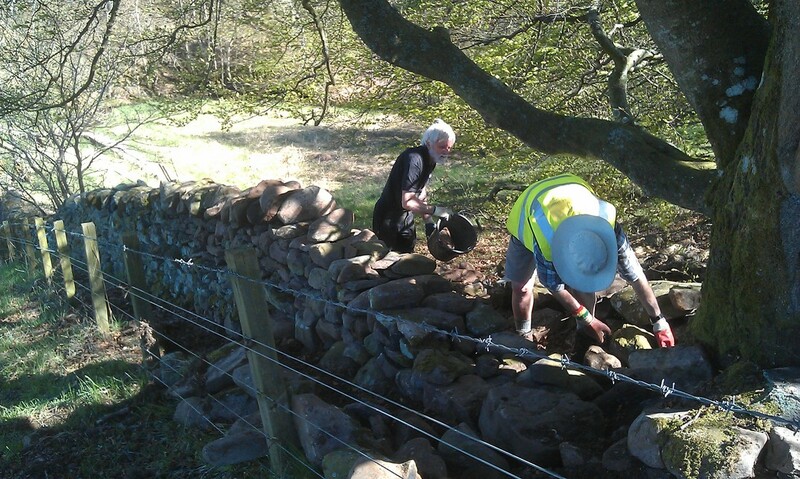 John and Alan showed up shortly afterwards, and between us we soon had the wall up to height. 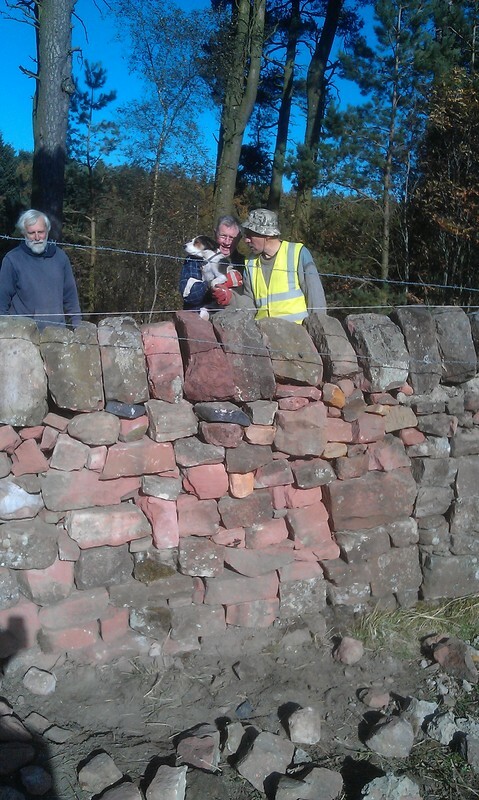 And coped (ably overseen by Coolie the dog). 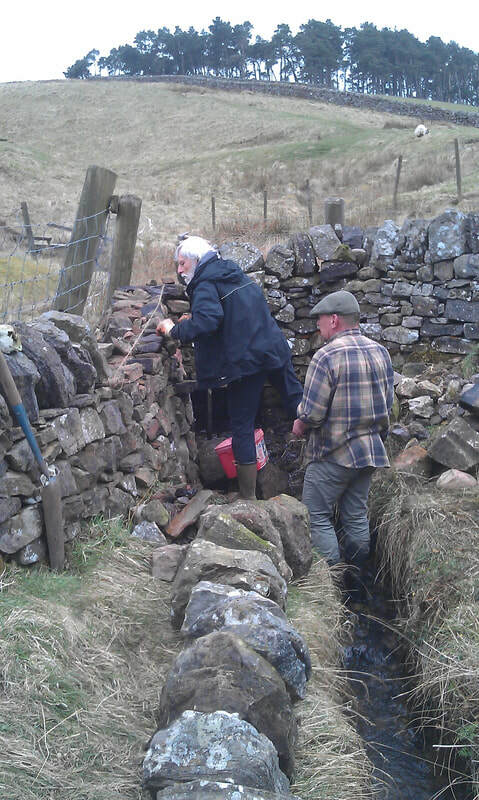 Dave had to head off, but the rest of us remained to tackle the near-hole that was forming a few yards further down the wall. 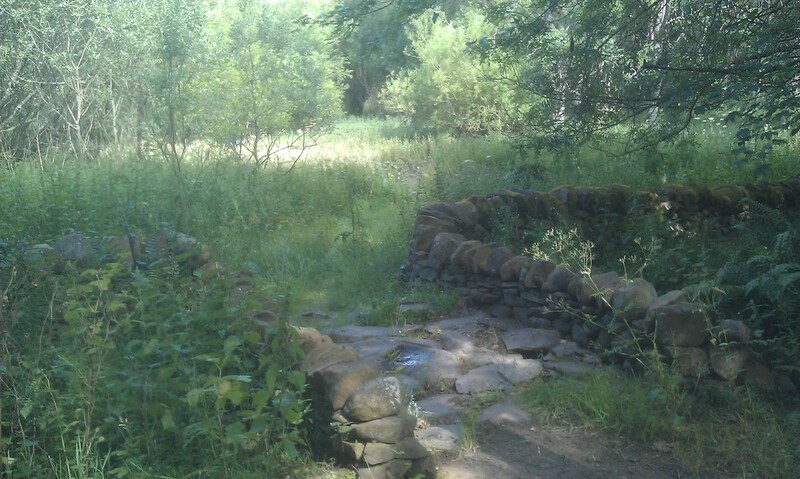 Once again, I forgot to take a 'before' picture, but this is how it looked after I gave it a shove. 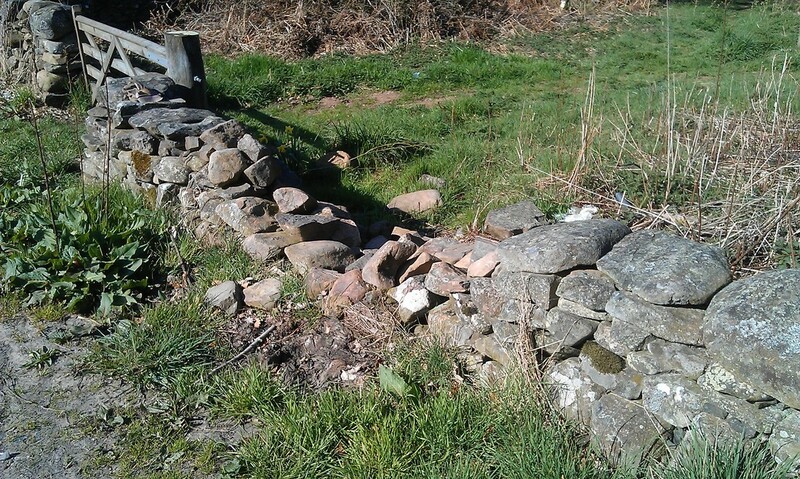 When we'd stripped out the loose stones, we found that there was a through stone just below the gap, much subsided at one end but still pretty much in place. 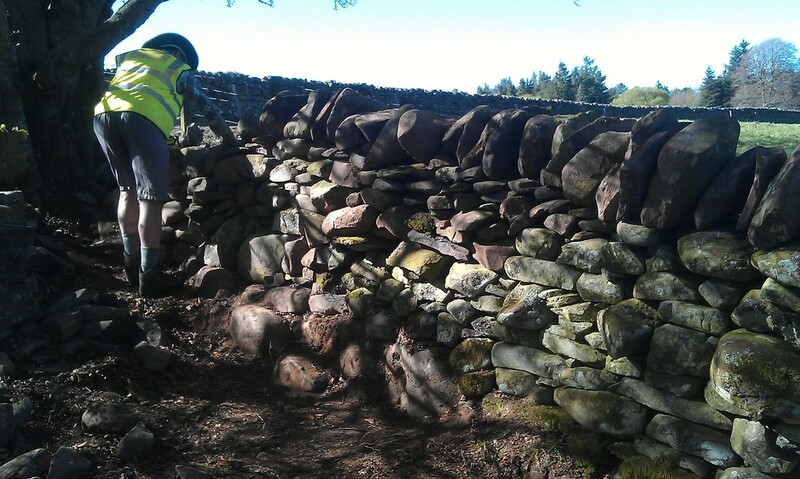 Stripping the wall right down and rebuilding it (which is what it really needs) would have been more work than we could have completed today, and seeing as the wall is required to keep the cattle in the field, this wasn't an option. 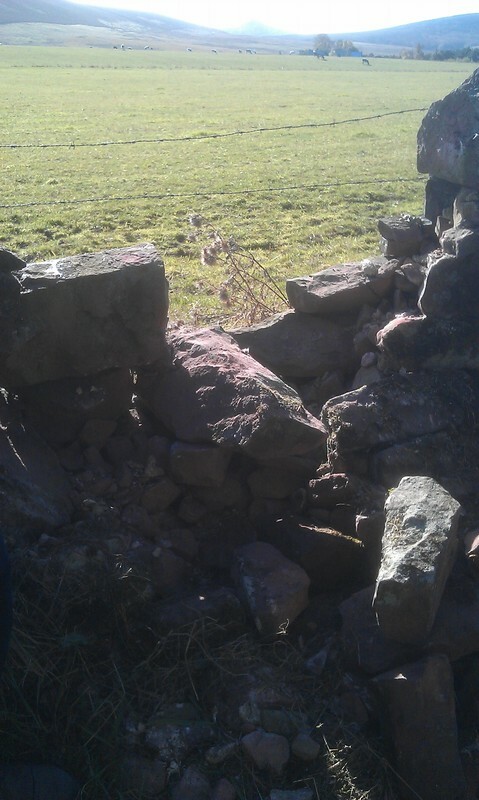 However, with some careful manhandling, we managed to prop the through up in a near-level position, in which we could rebuild the more-collapsed side of the wall around it. 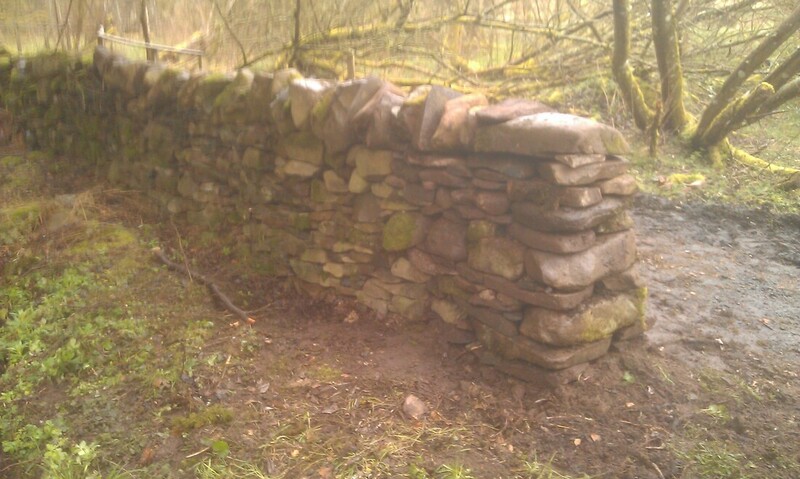 So this we did, rebuilding the wall from as far down as we could go without stripping much more of the top levels back. 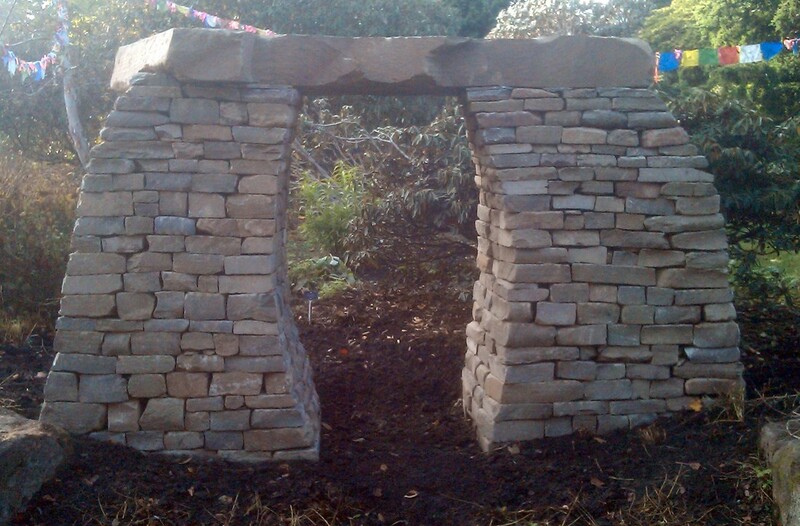 This meant leaving the 'field' side still largely traced, but by rebuilding the 'path' side more solidly, hopefully making the wall strong enough to stand. 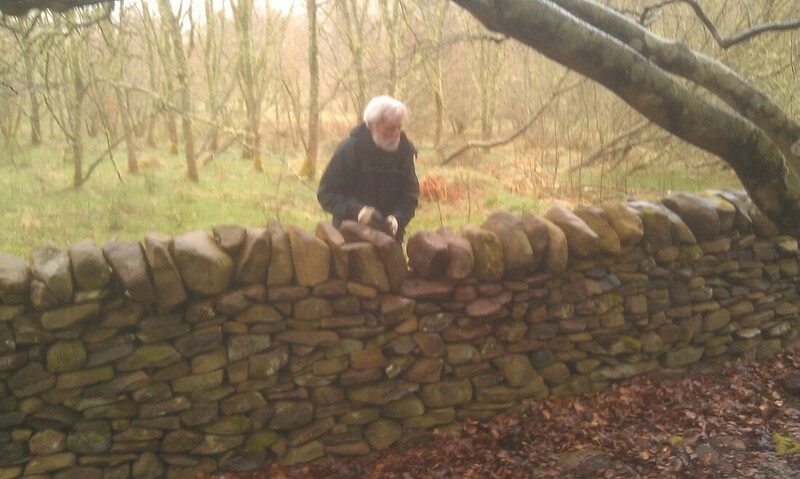 John also had to leave at this point, and Alan and I (after a brief break for some lunch) finished off the wall. And put the copes back on. 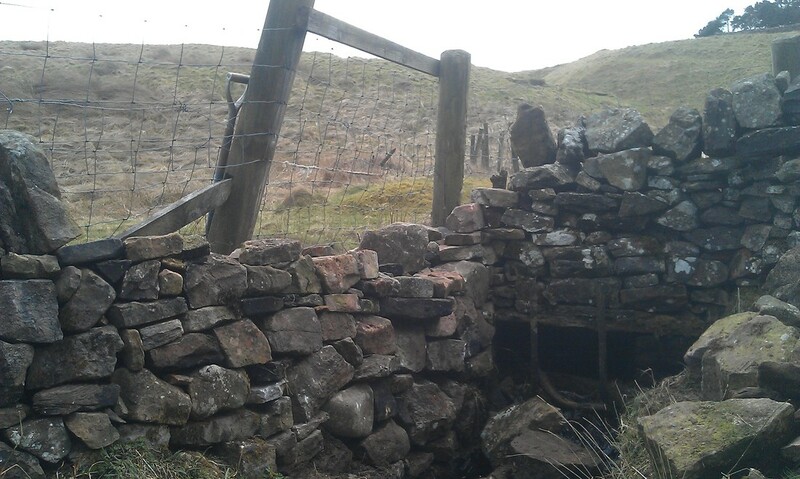 There wasn't really time for us to tackle any of the many other sections of this wall in a state of near-collapse, but while looking for a place to climb back over I spotted another hole nearby which looked to me like it might not last the winter. 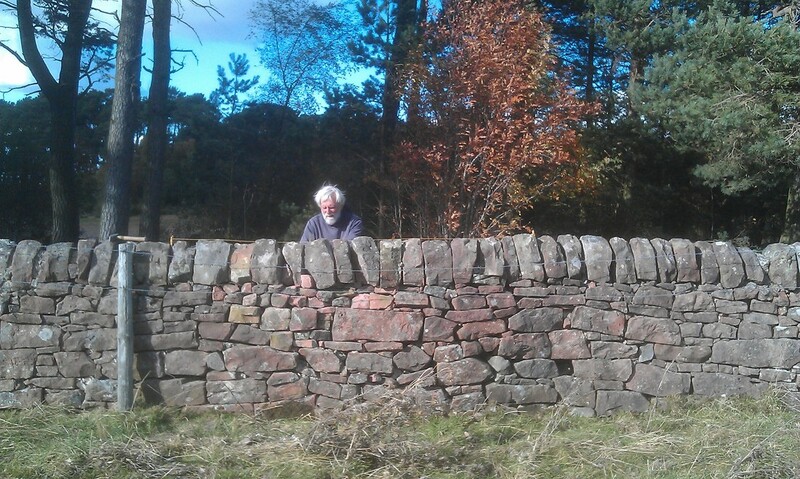 So Alan very patiently waited while I put the stones back in. 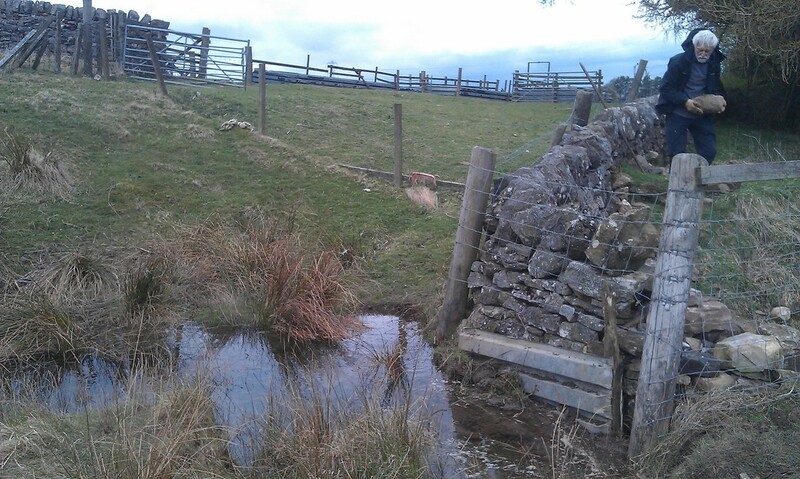 It's far from perfect, but hopefully it'll be one less place for the livestock to escape through. 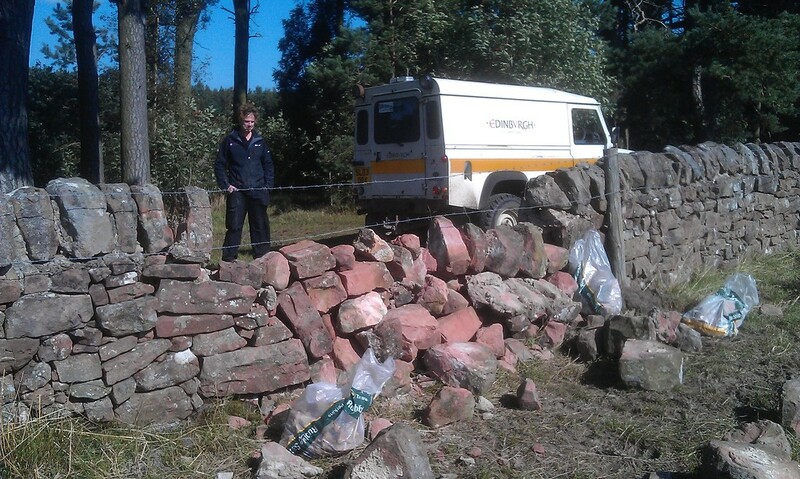 So, on the second of this month we went to Harlaw in the Pentllands to repair a section of wall which had come down, and had resulted in the cattle in the field escaping. 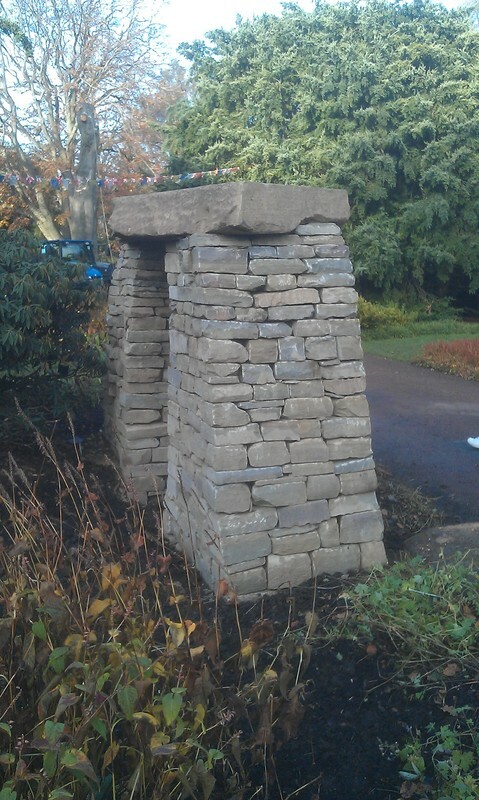 And for once, I have 'before' pictures - not because I remembered on the day, but because I'd been to the site a couple of days before hand to check out how much work there was, and to deliver some extra stone. 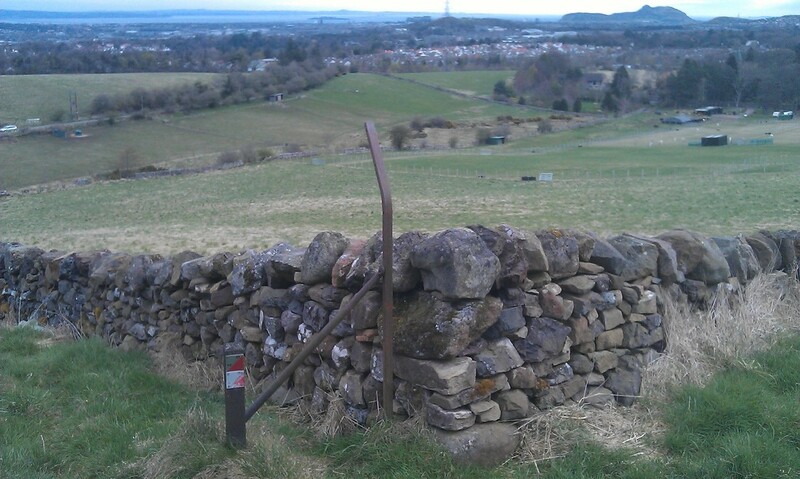 It was a glorious day (I'd've happily stayed up there and climbed a few hills, if I'd had the time) but the wall had almost totally collapsed, and the park rangers had had to pile up the stones as a temporary repair to fill the gap below the barbed wire to keep the cattle in. 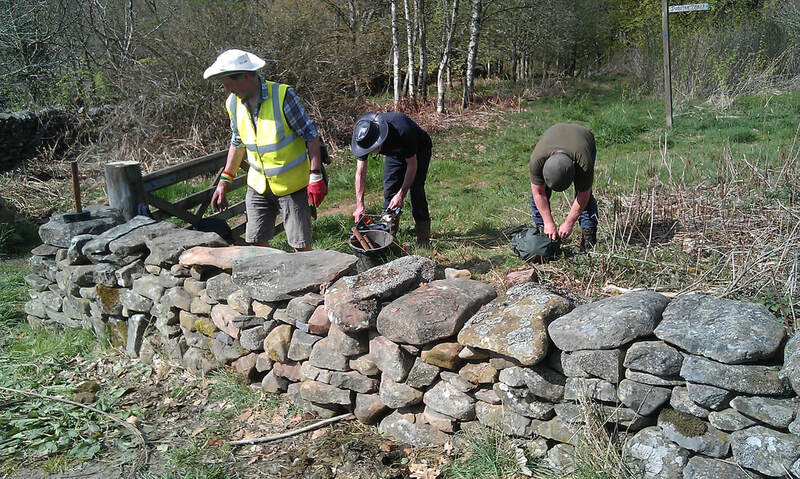 Sadly, it wasn't nearly such a nice day when we came to do the work, but at least it was dry and there was a breeze which kept the insects at bay. 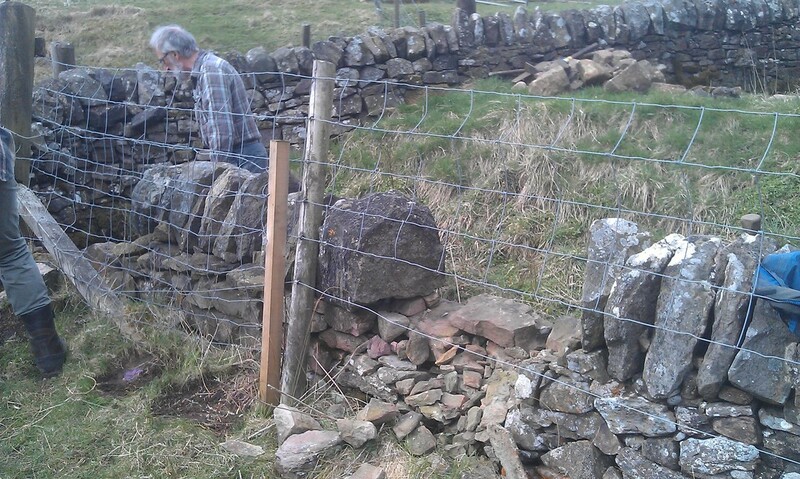 The first thing we needed to do was move the barbed wire - fortunately an easy enough job as the fence posts weren't in very deep - and then strip the wall back to the foundations. 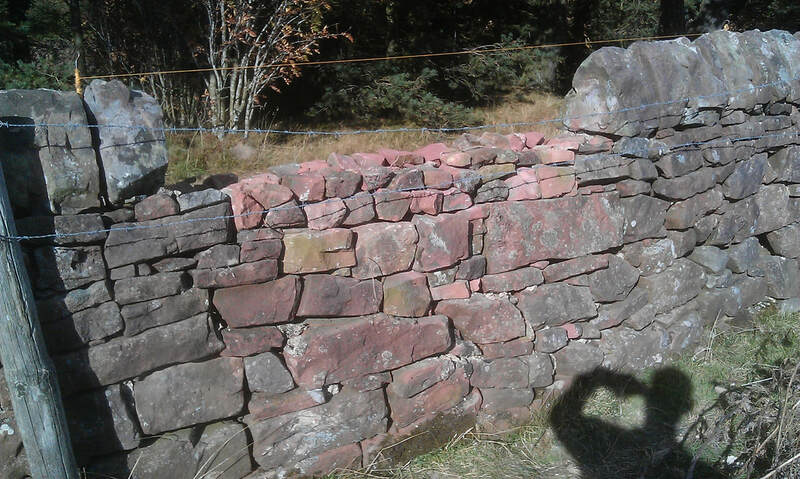 This wasn't too difficult as the wall, unsurprising, came down very easily: in fact, a bit too easily, and what had started as a three metre gap soon became more like five or six metres as the defects in the initial build and subsequent repairs made their inadequacies felt. 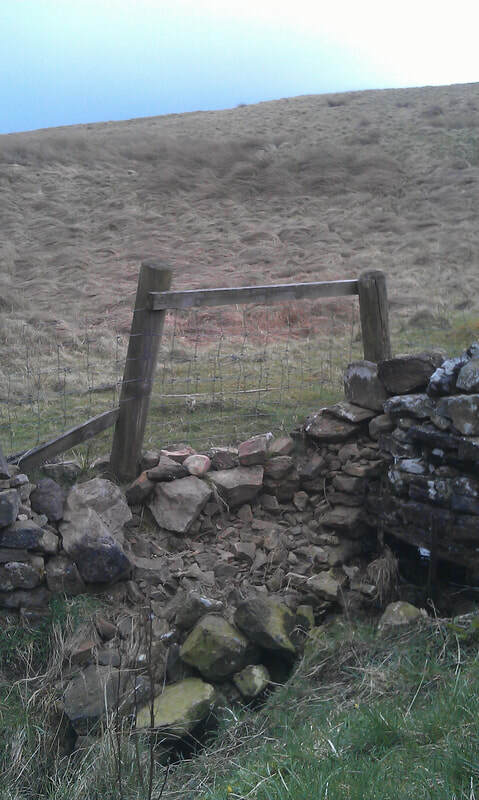 In fact, this was almost a master class in how not to build and maintain a dry stone wall. 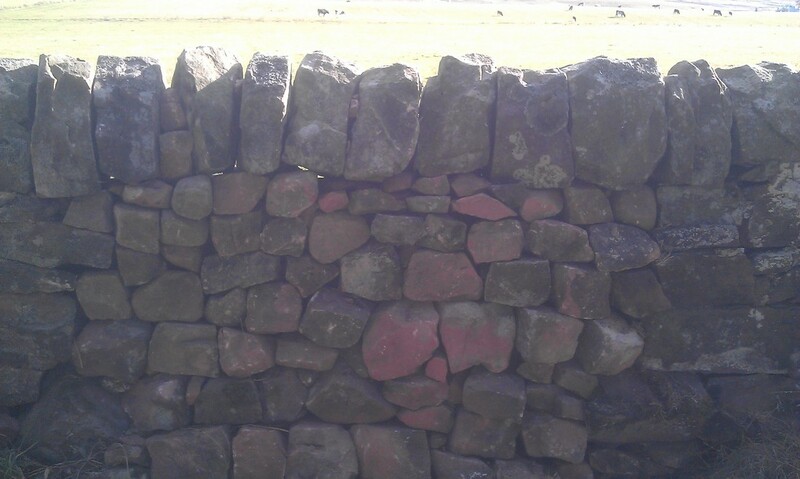 The stones had been 'traced' (that is, they had been placed with their length running along the wall, rather than in to it), plus the section we were working on had no throughs (stones reaching right through the thickness of the wall, binding the two sides together) - and where there was a through a bit further along, there were running joints up both sides of it, greatly limiting its effectiveness. 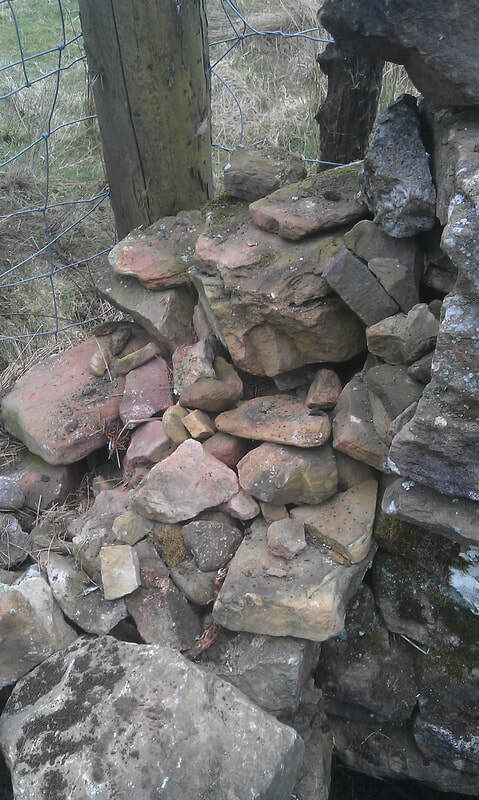 Add to this the fact that when we got down to the foundation stones we found some of them to be sloping out of the wall and it wasn't surprising that the wall had started to 'spread', i.e. 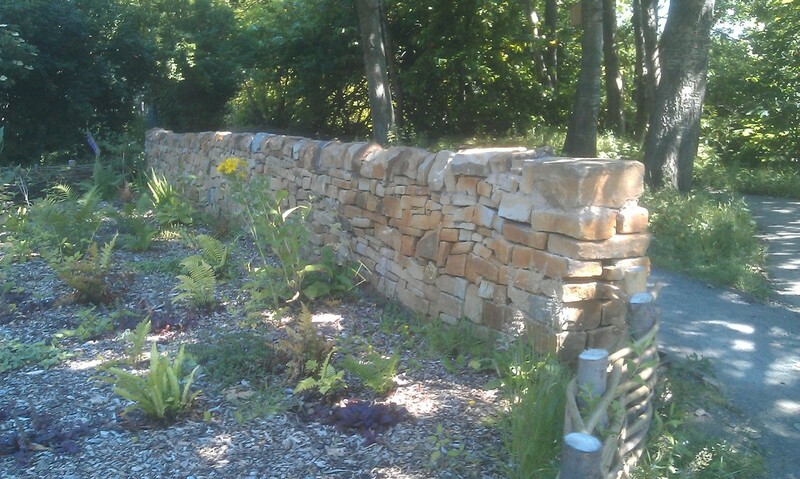 the sides had started to move apart at the bottom. 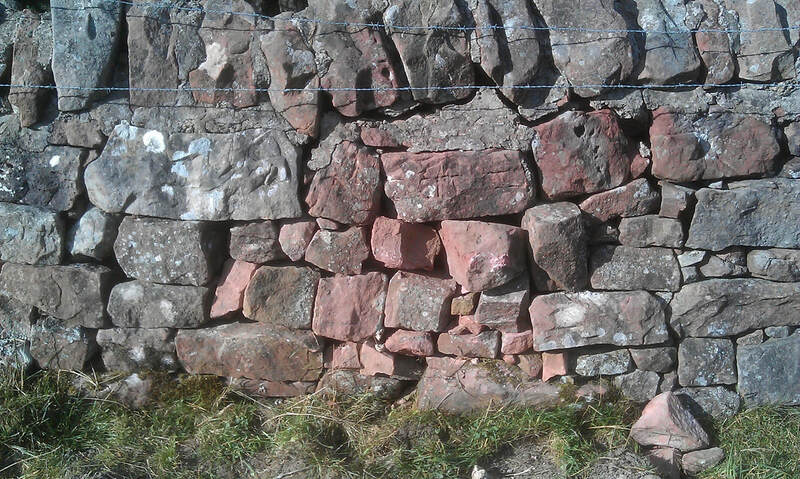 This still might not have caused a collapse if the wall had been left dry (and therefore flexible, with gravity holding everything together despite the movement), but an earlier attempt at repair had seen the copes mortared into place. 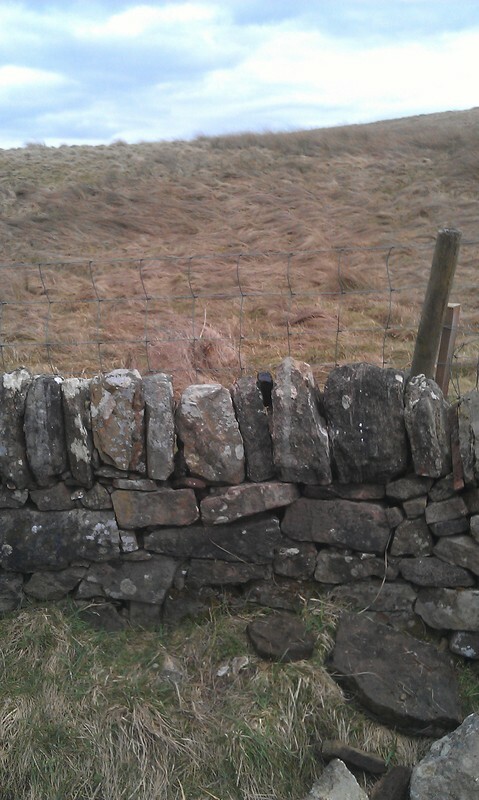 And while this might have been very effective at the time, a few years down the line the spreading had caused the stones below the cope to move down so that they were no longer held in place, and so had started to fall out: from there, it was just a matter of time before it all came down. ​Our section was by no means the only place this problem had evinced itself: just a couple of metres past the running-joint-through a large hole has appeared on one side of the wall, and this section will come down soon as well unless it's fixed - and indeed, there were plenty of other places where the same problems are starting to show. 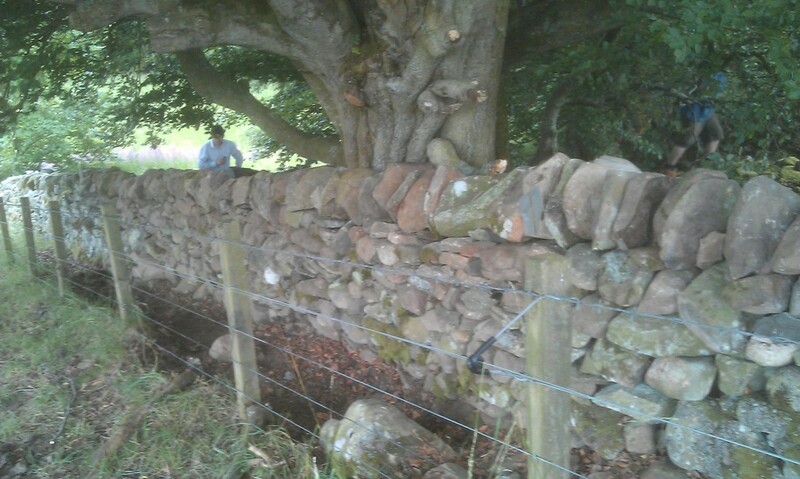 All the above, obviously, is why we were here, and so we set about putting it back up correctly. 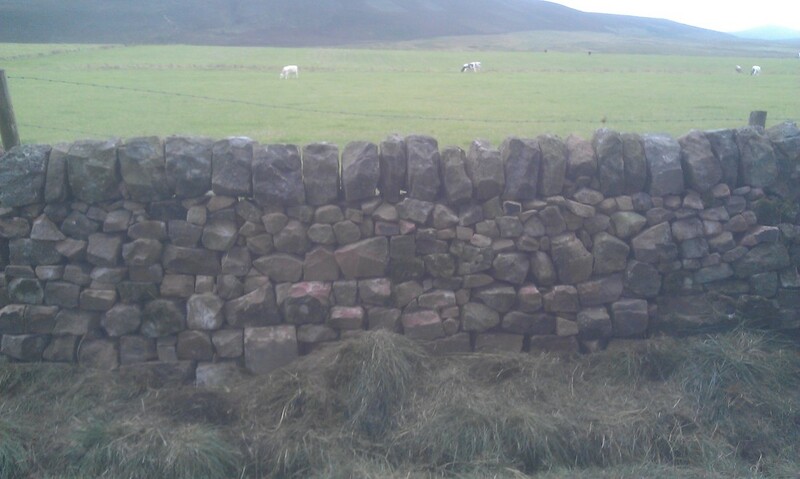 This is where we'd got to by lunch time - note the big stones set with their length running in to the wall (so not traced!). 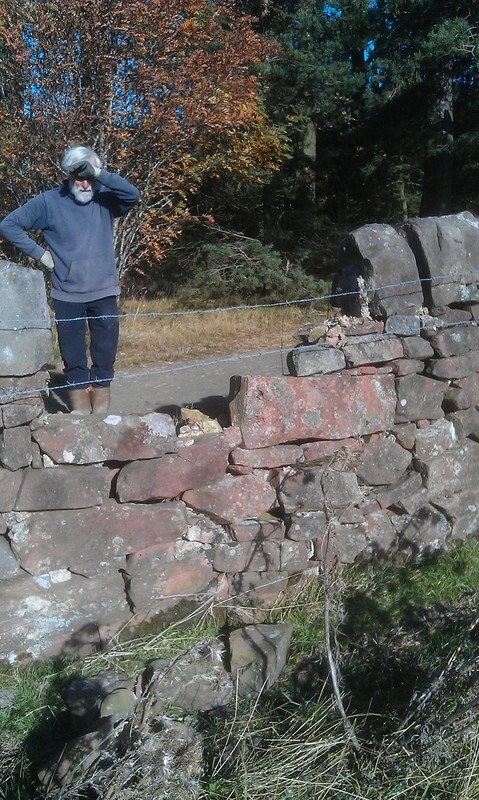 And by mid-afternoon we were up to 'through' level (you can just see a through on the wall just behind Alan - fortunately we had a few long stones which would do the job). 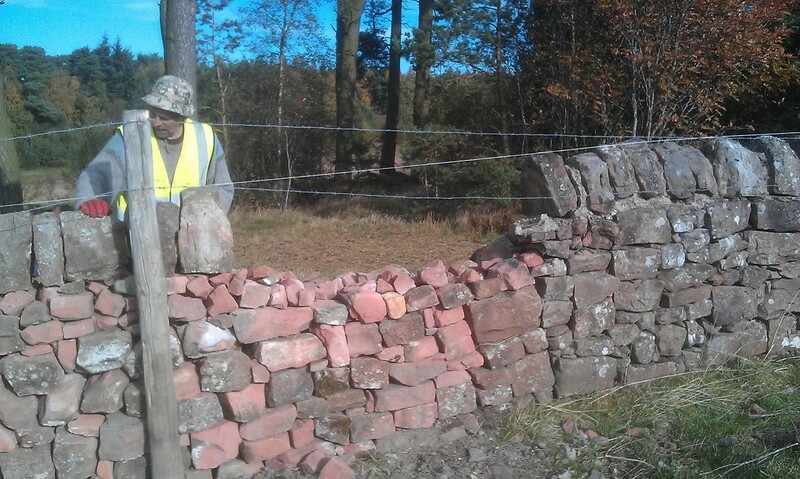 As the afternoon wore on, it became clear that we wouldn't have quite enough stone to finish the job: this was my bad, as the duty ranger had dropped by earlier and asked if we needed more stone, and I'd reckoned we'd be all right (to be fair to myself, we weren't far short). 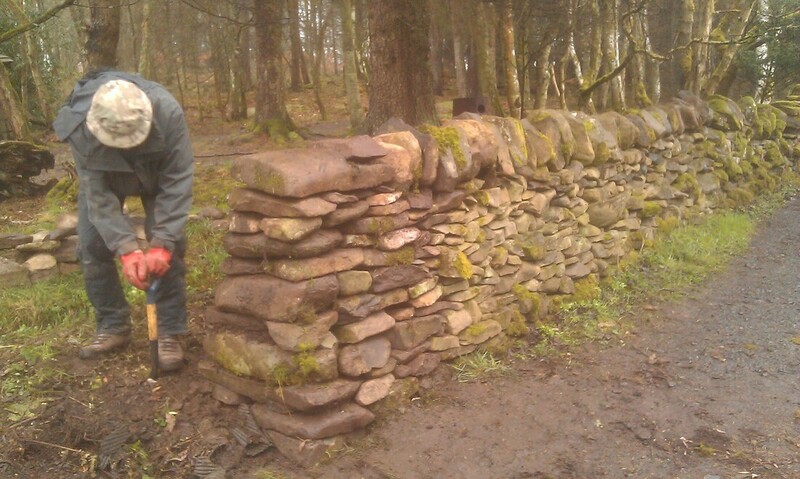 We did as much as we could, and managed to get most of the gap up to cope height. 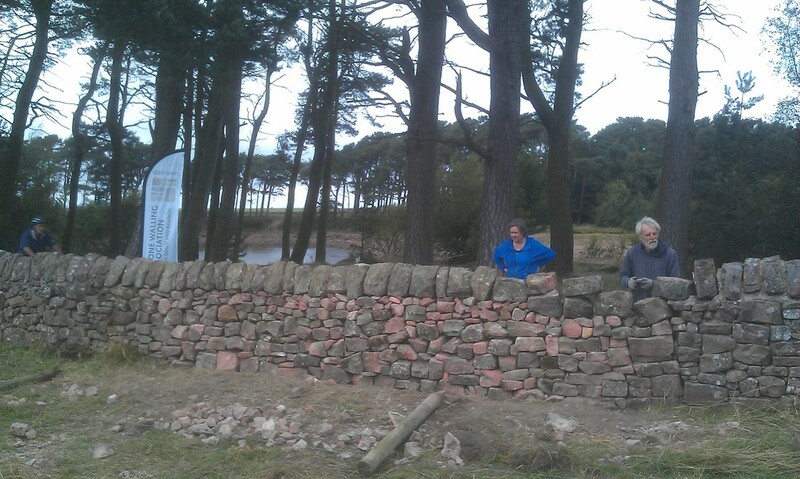 We then coped the whole wall, including the unfinished bit - this last just temporarily (it doesn't look too bad from this side). 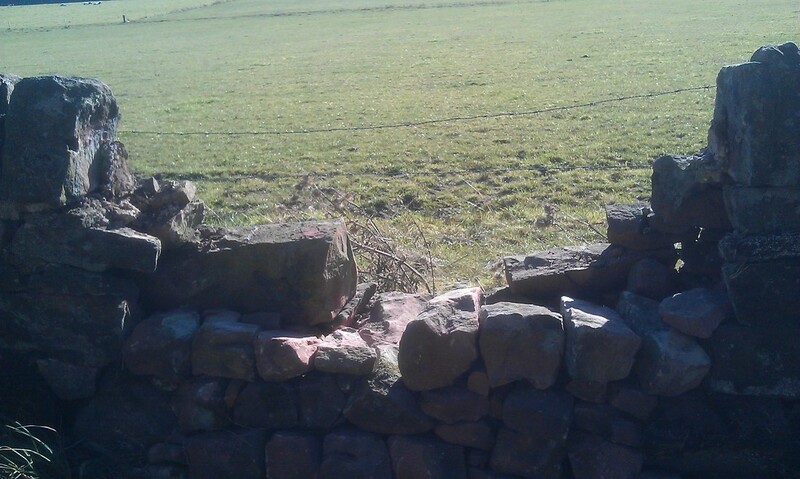 Note also the running joint still evident next to the through in the bit of the wall just to the left of where we were working - we would really have liked to fix this as well, but there's a limit to what we can do in one day. 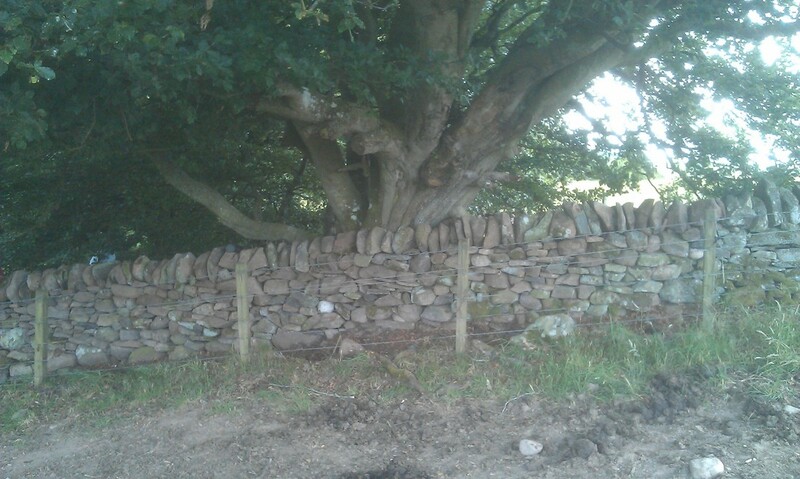 After that it was just a matter of re-instating the barbed wire, and the finished wall looks a lot better than it did. 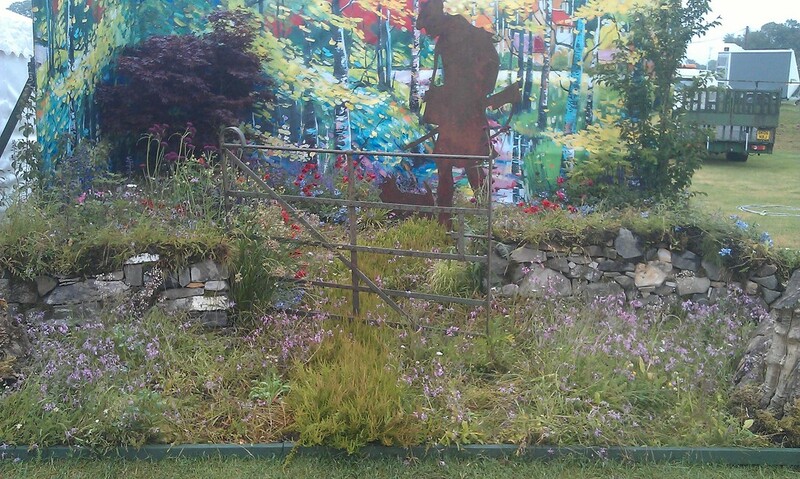 Though maybe best not to mention the 'unfinished' bit (this is how it looks from the other side). 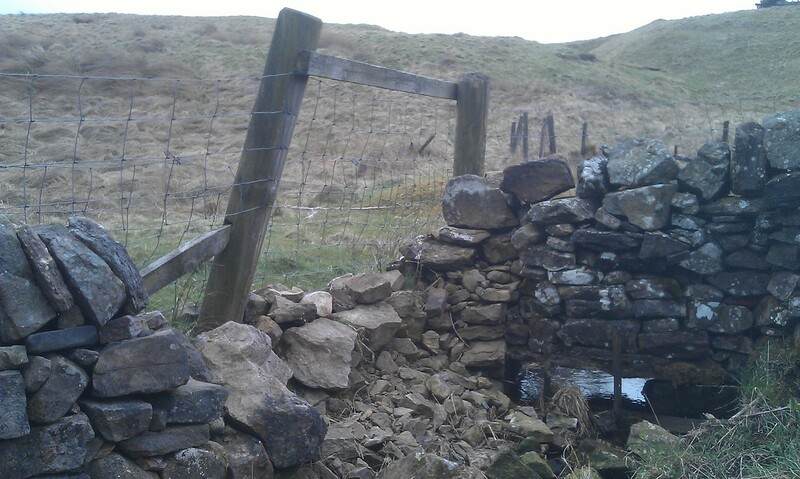 Hopefully it will stay up until we can get back up there to finish it off properly (and fix that other big hole while we're up there, before that bit comes down too). 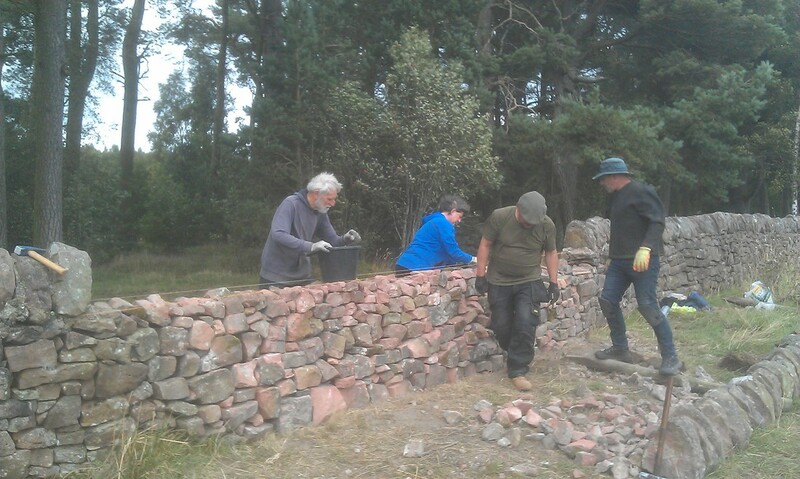 Today we (Alan, Richard, Ian and myself) went back to Wooplaw to finish off the wall repair we started earlier in the year. 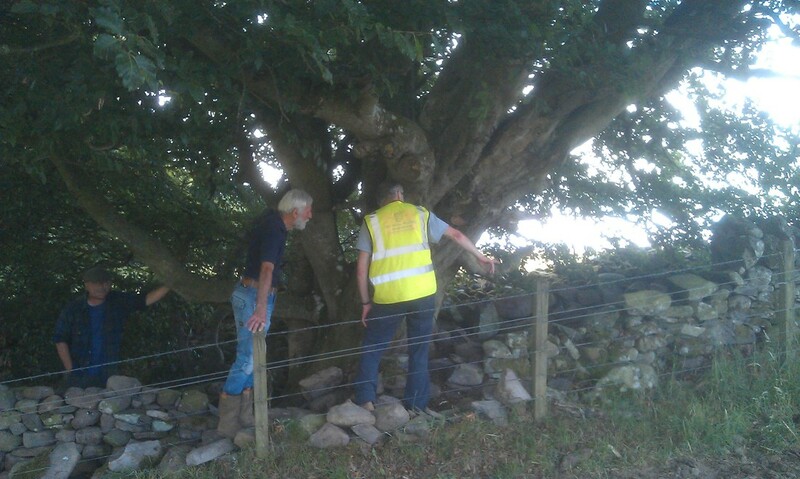 It was good to see that the work we'd done on our last visit was still up, but there was still quite a bit of work to do, including the tricky bit round the tree. 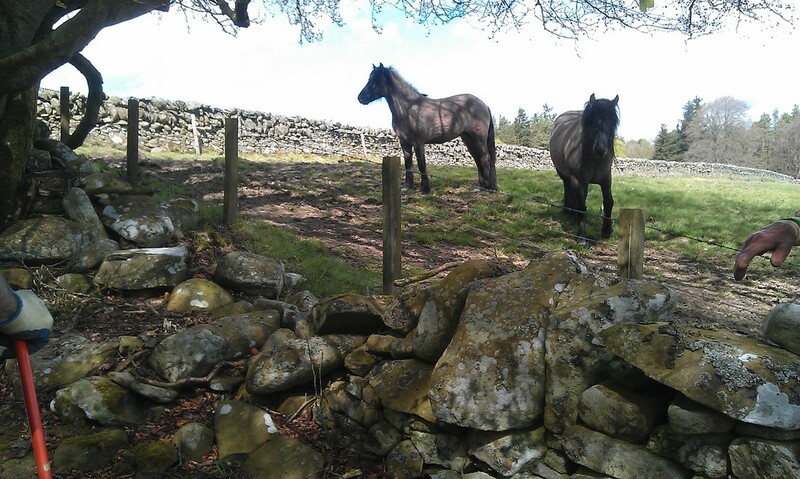 The horses were still there, seemingly a little less shy than last time (perhaps they remembered us, a harmless bunch of humans whose main interest seems to be making long, orderly piles of stones). And there were some other creatures ... if you look closly, you might be able to spot a monkey in the tree ..
Before lunch I took a stroll over from Gullet Wood (where we were working) to Big Wood (the monkey needed to use the facilities,such as they are). 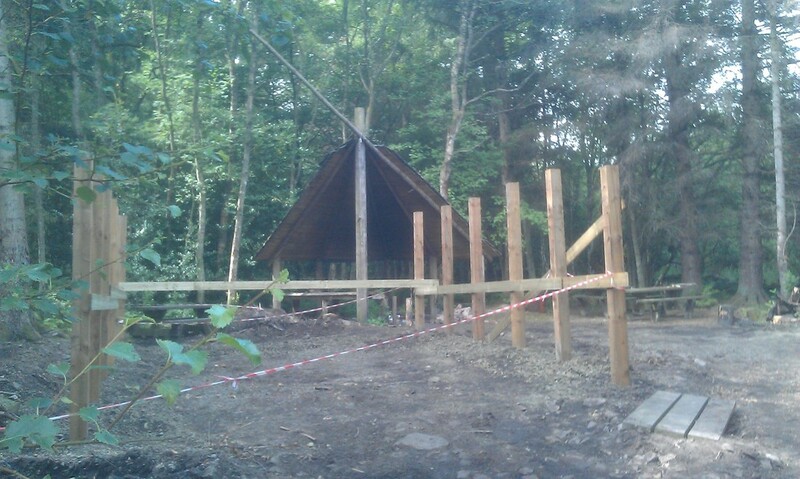 Work seems to have been progressing on rebuilding the log cabin, which was burnt down by vandals last year. 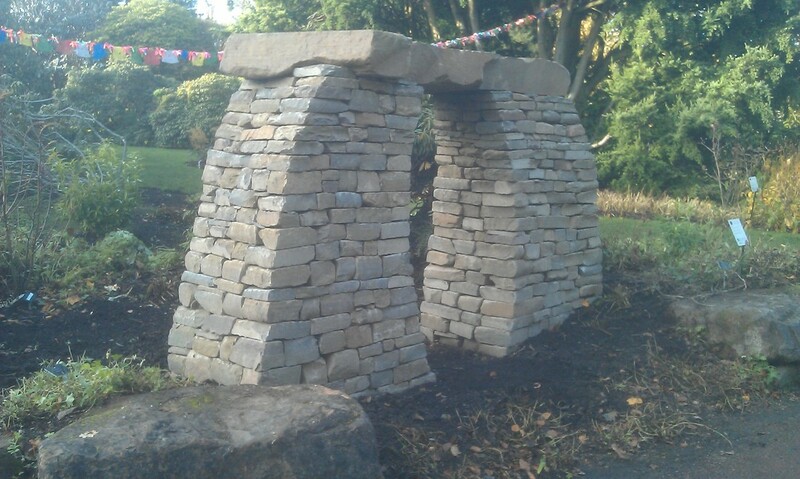 While I was there I popped down to have a look at the bridge we built, and was happy to see it still in situ and looking good. 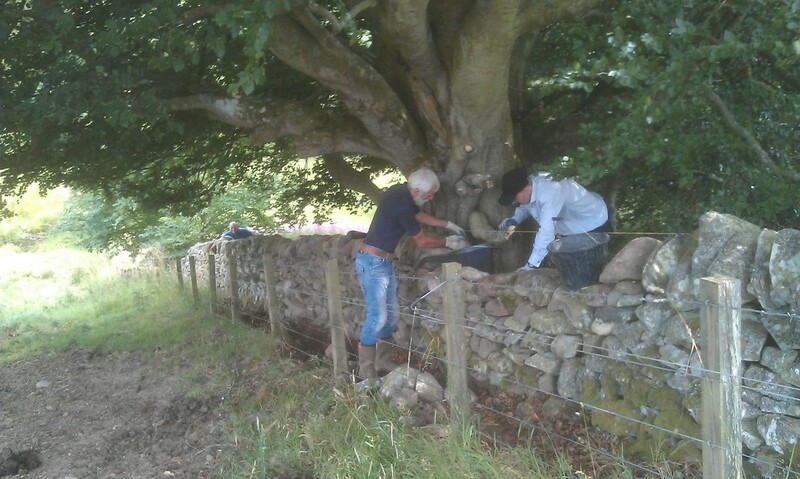 Meanwhile,back at Gullet Wood work was continuing apace, and by early afternoon the wall below the tree was complete. 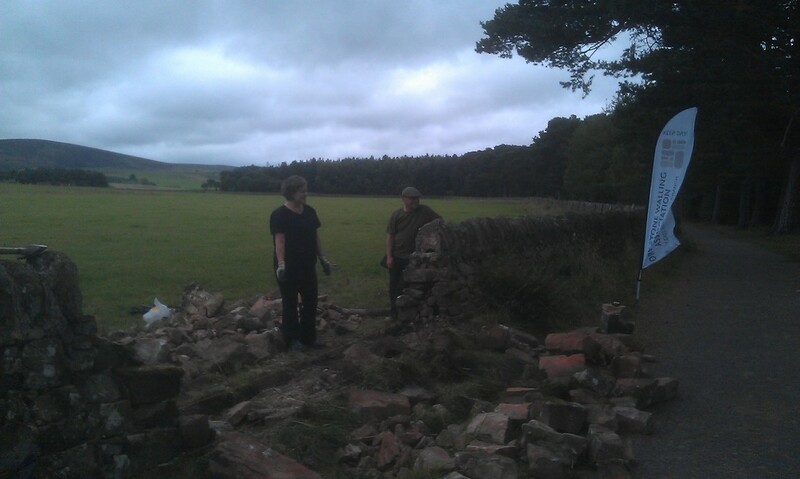 Richard had to leave us then, but shortly after his departure Chris showed up, and with his help we tackled the remaining section of wall. 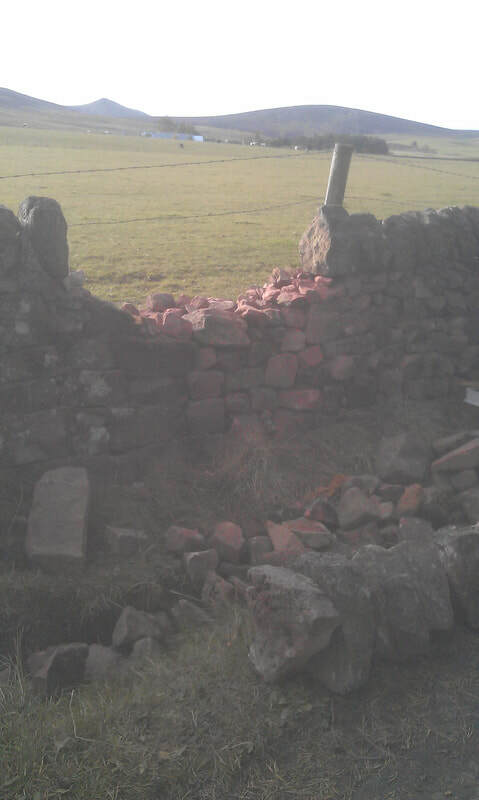 And by about 3 o'clock it was all back up. 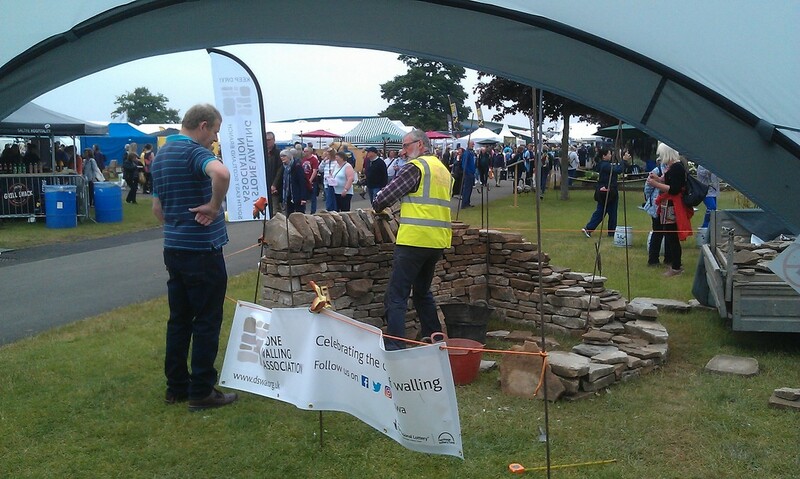 Yesterday we staged a small dry stone walling demonstration at the Haddington Agricultural Show. 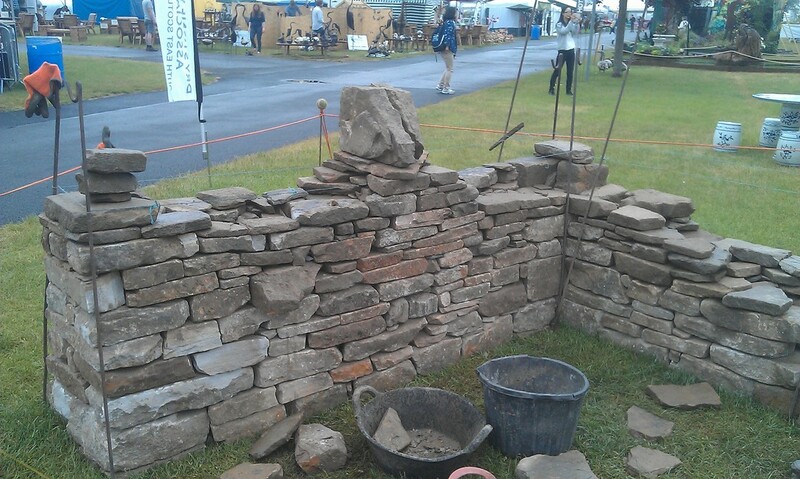 The show was only on for one day, but we managed to build a couple of metres or so of a small wall, and received quite a lot of interest in what we were doing and the craft in general. 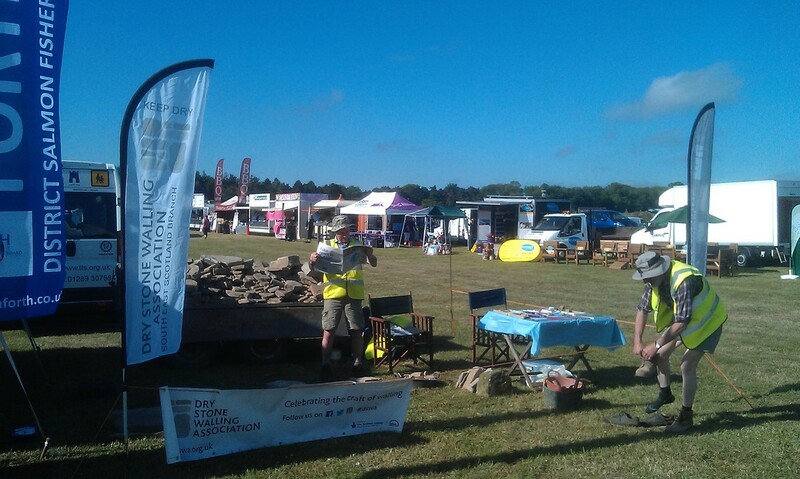 It was bright and sunny all day, but there was a breeze so it didn't feel too hot (I managed to sunburn myself - I really must look out my sun hat). 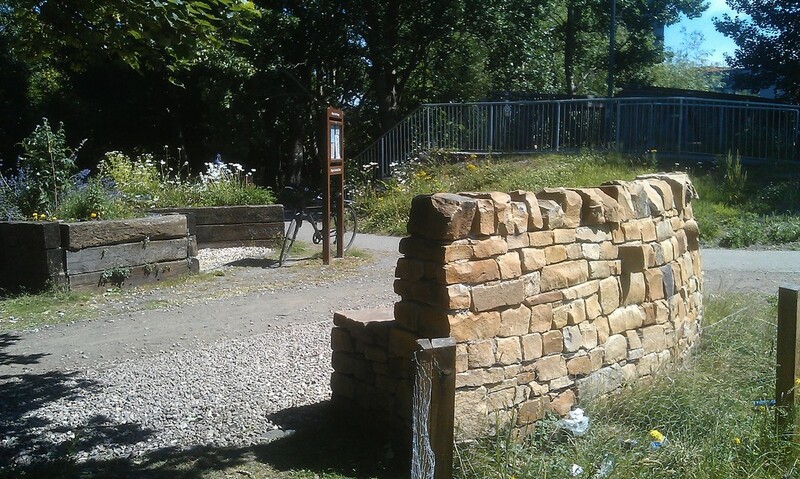 Last week I had a chance to visit the garden we helped to build at Balgreen on the Water of Leith in Edinburgh. 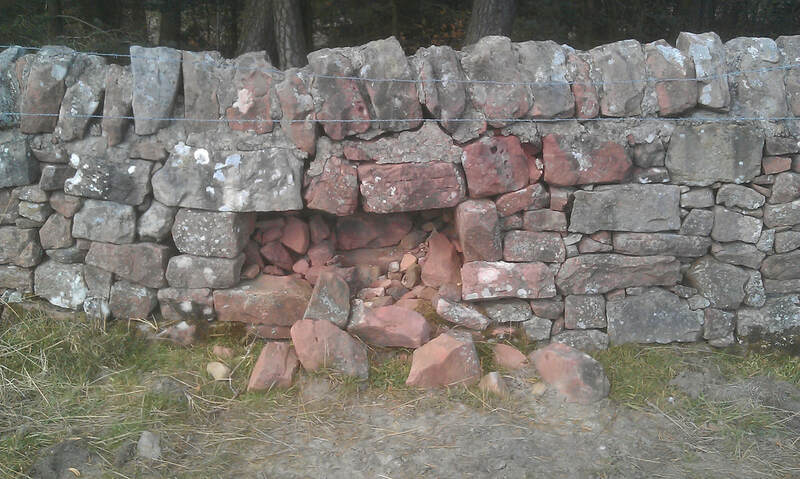 Both the wall and the seat were still standing - and pleasingly unvandalised. 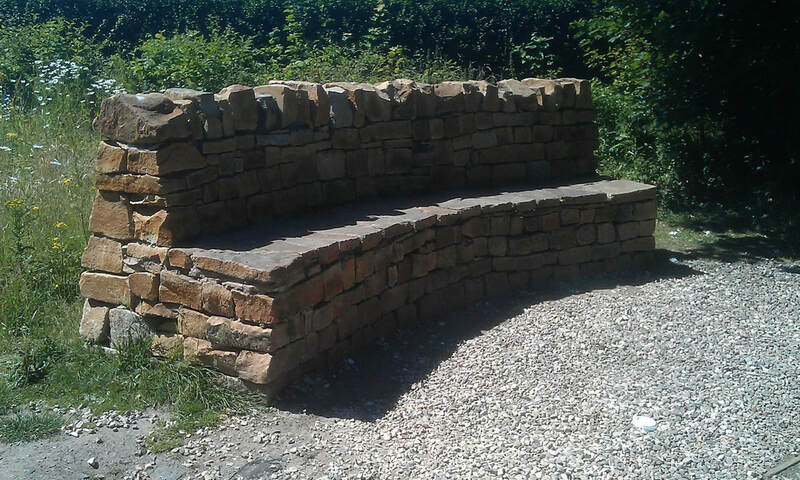 I sat and had my lunch on the seat, and very pleasant it was, too. 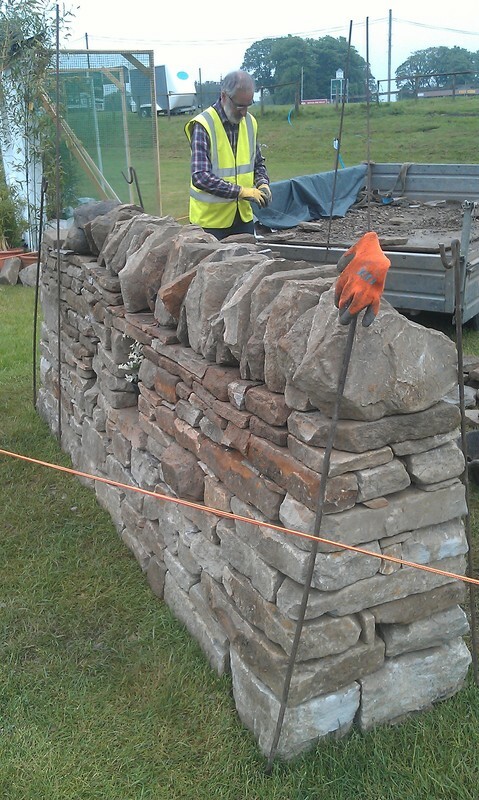 In previous years we've assisted with the West of Scotland Dry Stone Walling Association's show garden at Gardening Scotland. 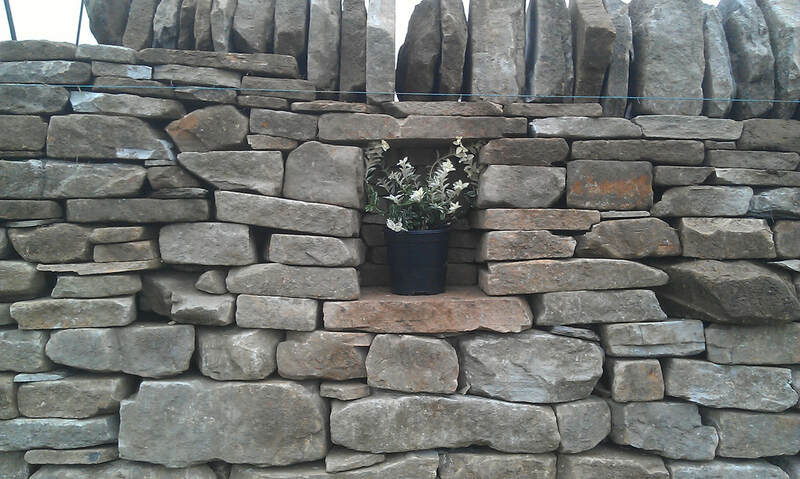 However, this year they decided not to enter, so rather than allow the public to be completely deprived of any dry stone walling* we put on a walling demonstration (being too small a branch to tackle a show garden ourselves). 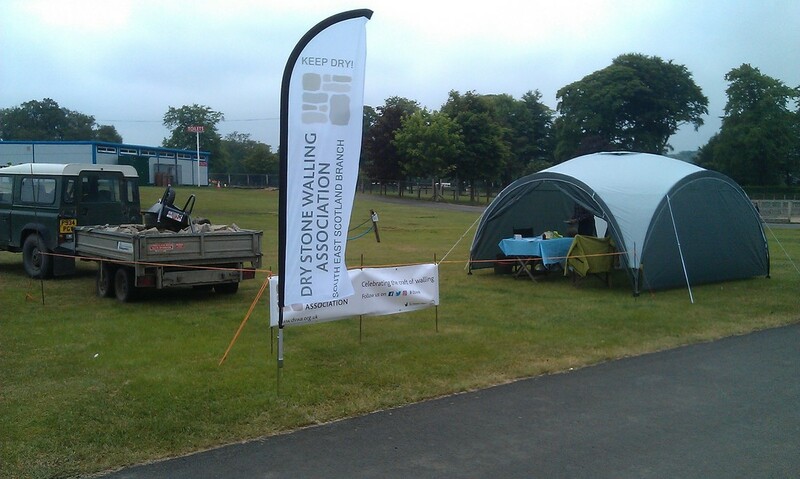 This meant that there was no "build weekend" - instead, on Thursday Richard and I went along and set up our new event shelter and banners, while Bruce brought along a couple of trailer loads of stone, borrowed for the weekend from a job he's working on. 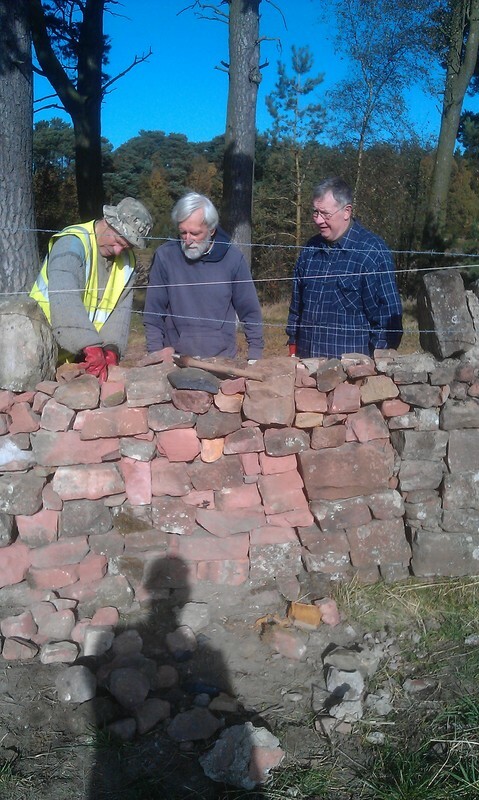 Bruce, Richard and Ian then went along on Friday and built a few metres of wall with a cheek end, a corner, a bend and a little alcove (Richard borrowed a plant to put in it - it is a gardening show, after all). 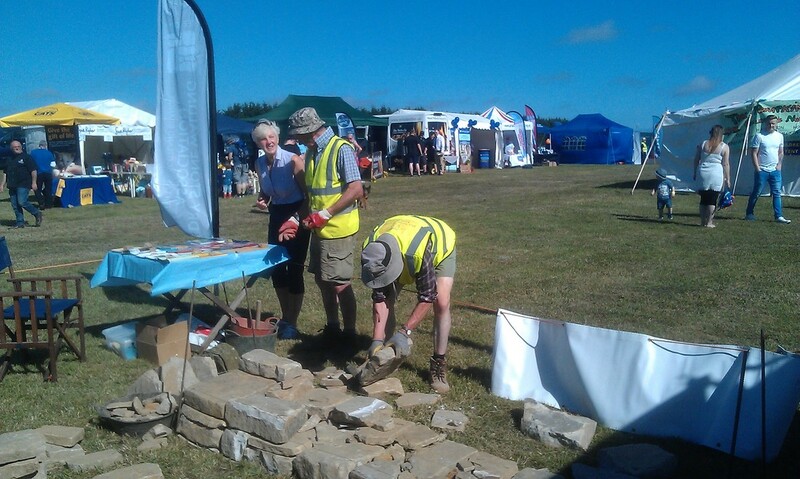 They got quite a lot built, despite stopping to talk to interested show goers. 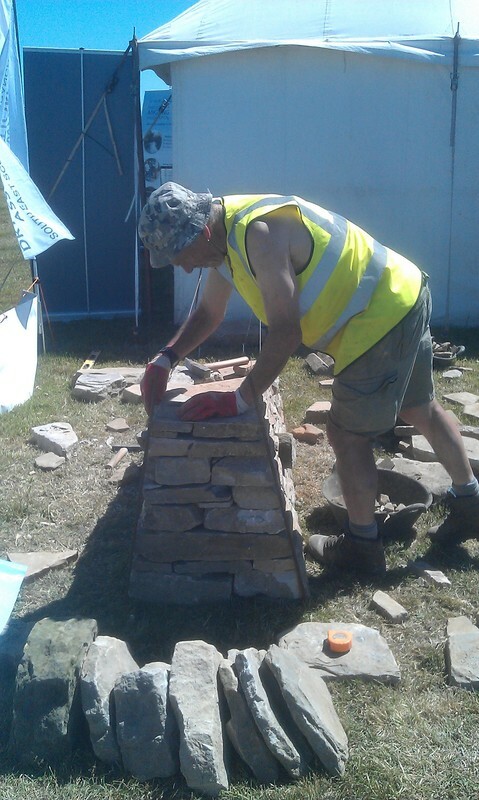 On Saturday Dave was there on his own and as a result was largely occupied with talking to the gardening public but did manage a bit more building, and then today Richard returned and I joined him, so that one of us could deal with questions while the other built (or bunked off to take photos). 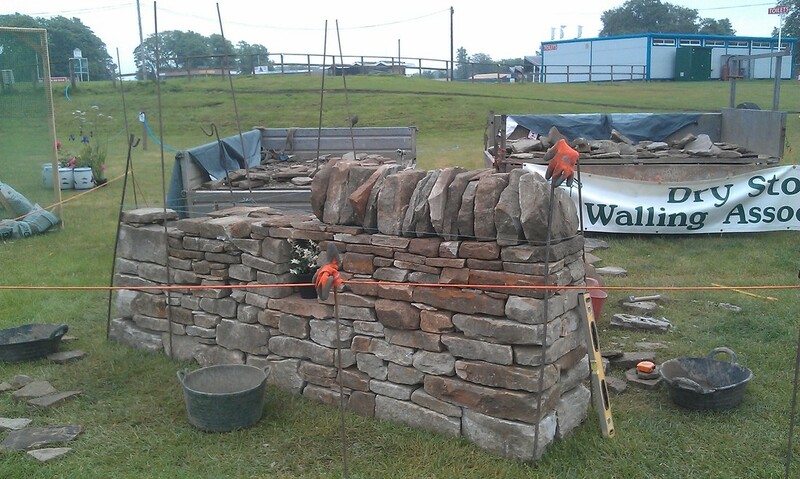 It was quite good having a partly built wall, as it gave us an opportunity to show how a dry stone wall is put together in such a way that what's basically a pile of stones can stay up for centuries. 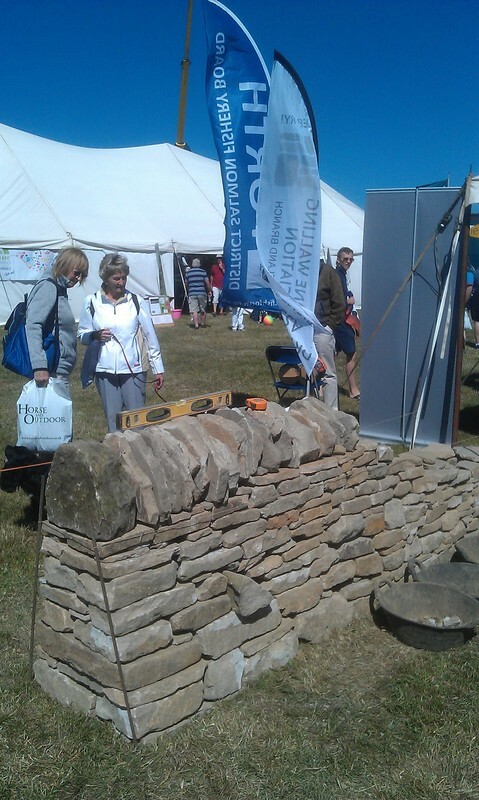 There was a lot of positive feedback (even some from farmers - stern critics of dry stone work). 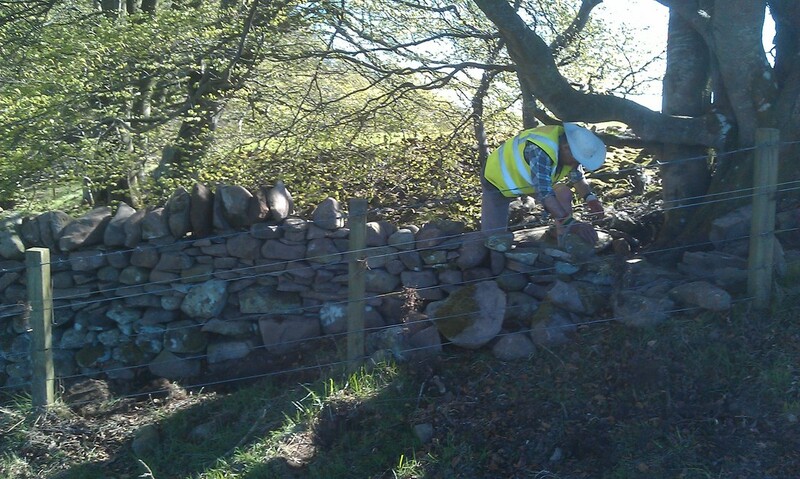 And by lunch time we'd got the corner pretty much completed and about half of the straight bit coped. 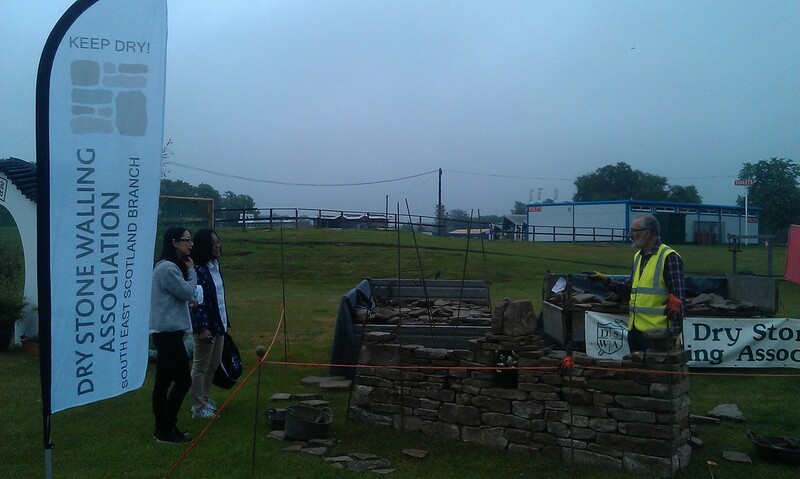 In the afternoon the rain which had been threatening all day arrived, so we retreated to the shelter for a while. 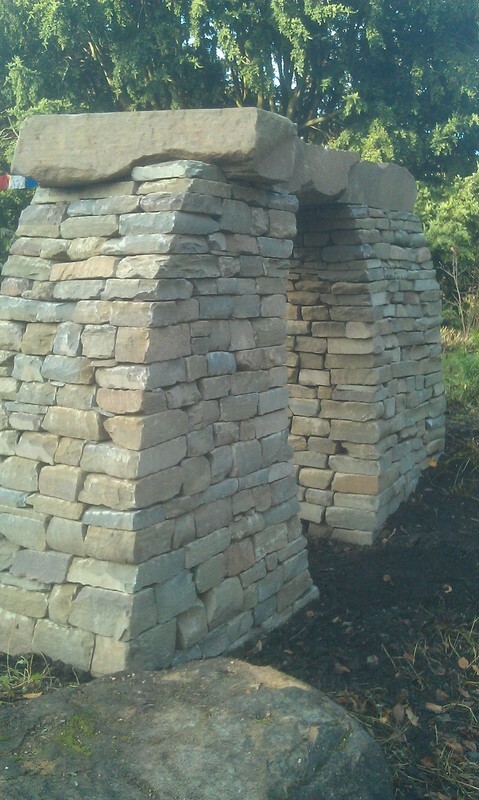 We got a bit more built after it went off, but by this time we'd used up almost all of the stone, and it was getting close to closing time anyway. 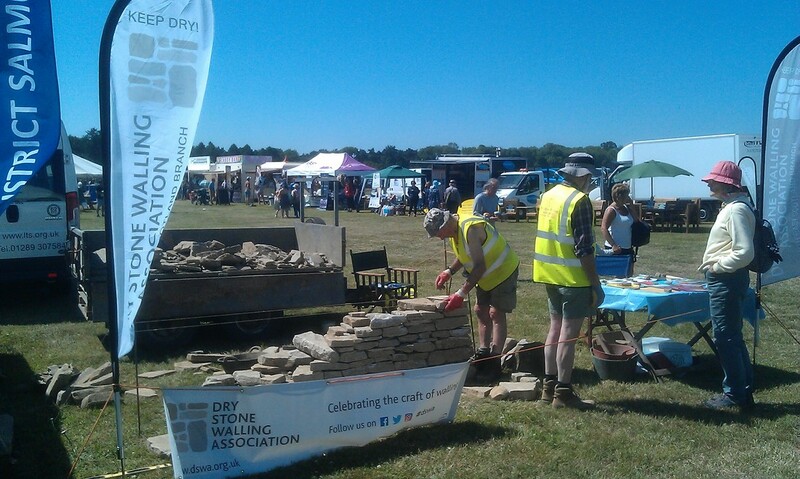 By four o'clock the crowds were thinning out, and those that were left were heading for the gardening exhibits to grab some ex-show bargains, so we started to take it down again, and by six our "lasts for centuries" wall was back on the trailers. 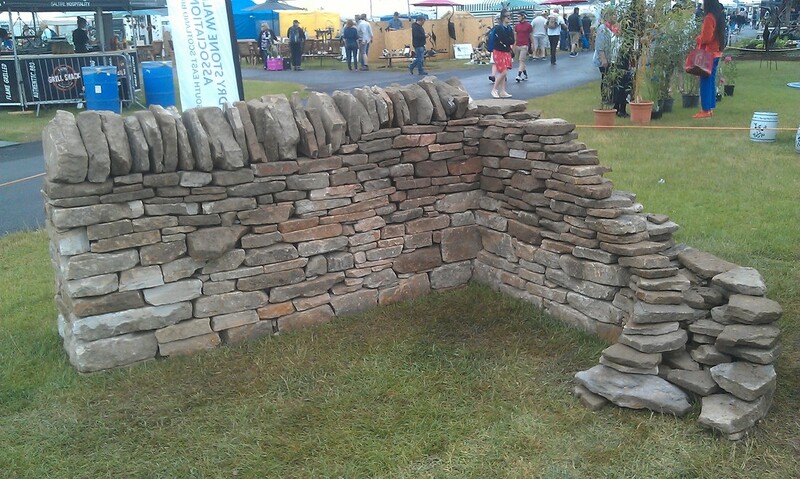 ​* This wouldn't actually have been the case, as one of the show gardens also had some dry stone work - quite nice work, too, though as you can see it was badly obscured by plants. 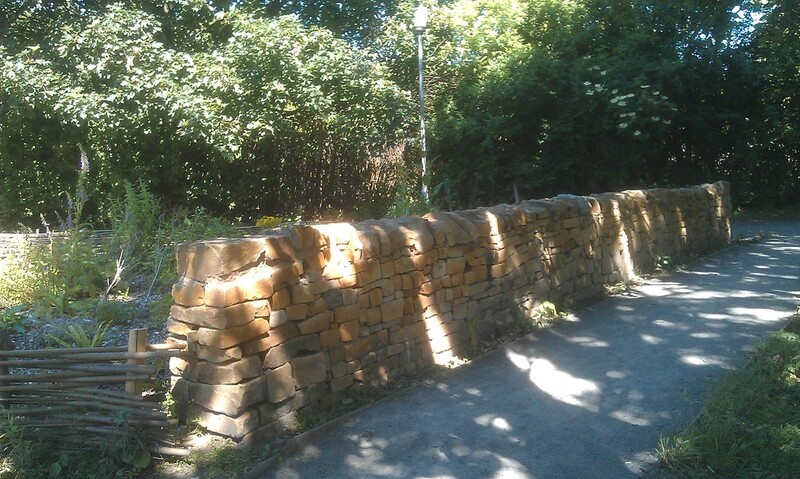 I noticed that a section of the low wall around the car park had been knocked down, so while I was waiting for the others I started to put it back up. 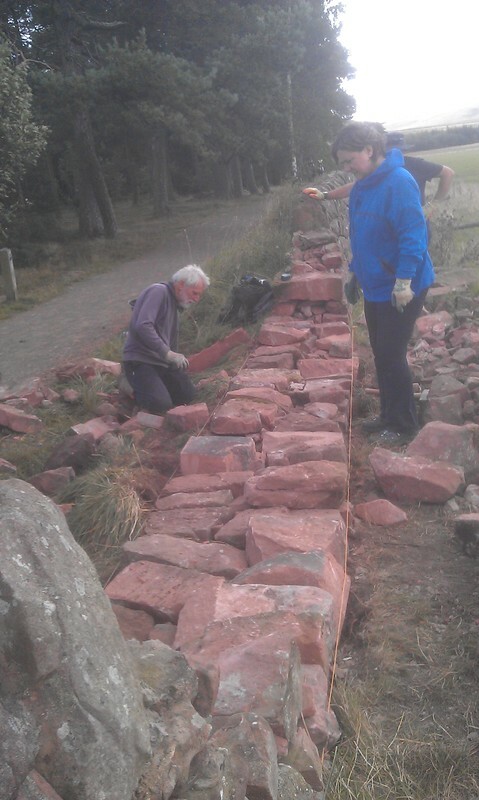 I hadn't even cleared away the fallen stones before they'd arrived, but with everyone working on it, it wasn't long before it was back up. 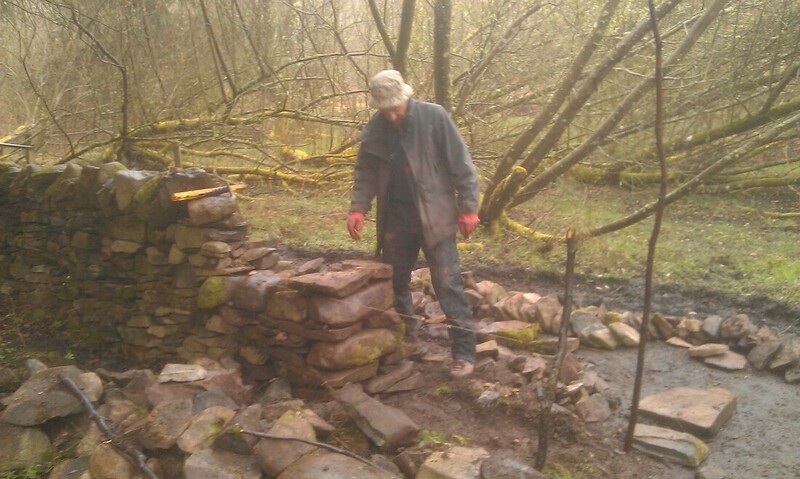 The actual section of wall we were scheduled to repair was further into the wood, on the other side of the burn. 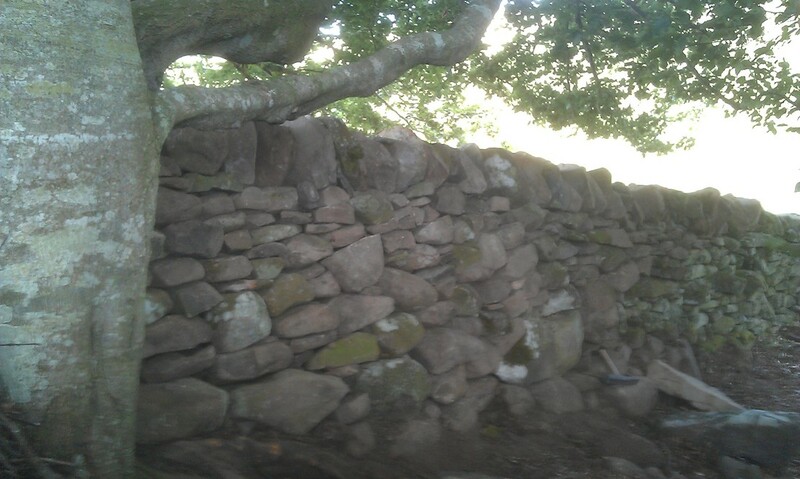 A tree had grown up a foot or two from the wall, and a century or two later had become big enough to knock it down. 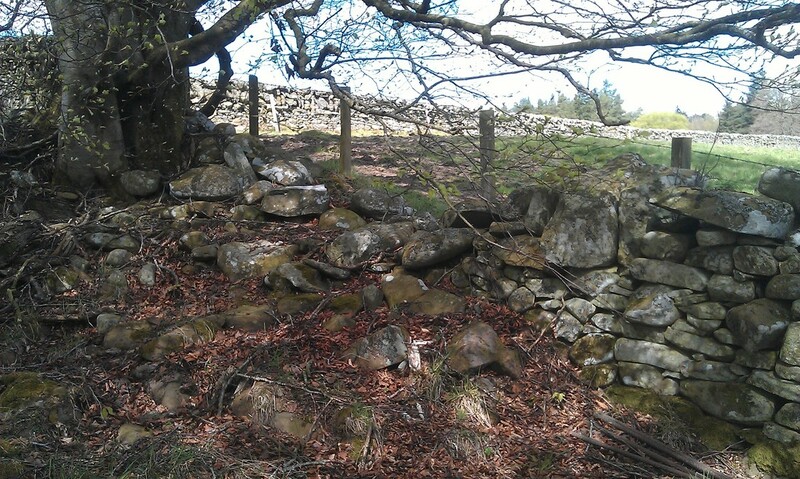 There was no shortage of stone, there being a stone dump just behind where we were working, but a lot of earth and tree roots had found their way into the wall, and there was a thick covering of leaves and beach nut shells. 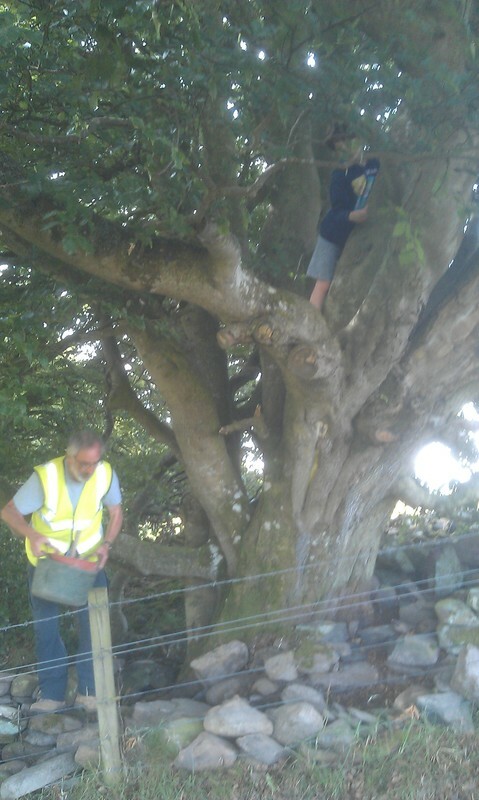 A few low branches needed pruned as well. 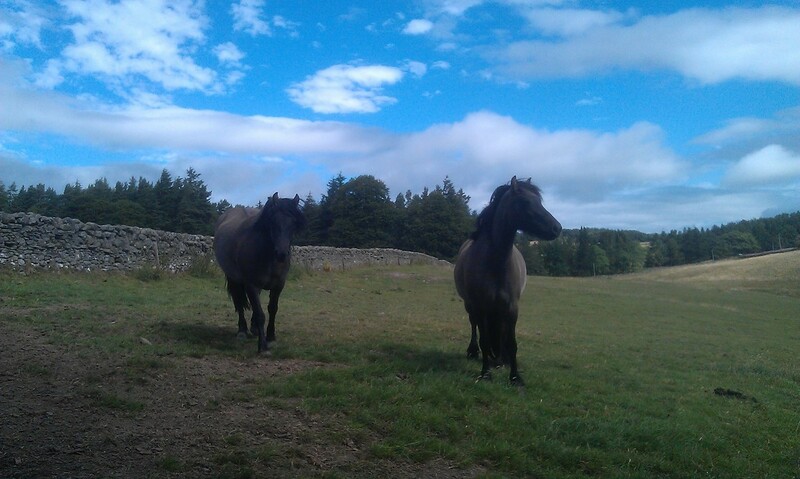 There were a couple of curious but easily startled ponies in the field next to us, but eventually they got over their nervousness and came over to have a look. 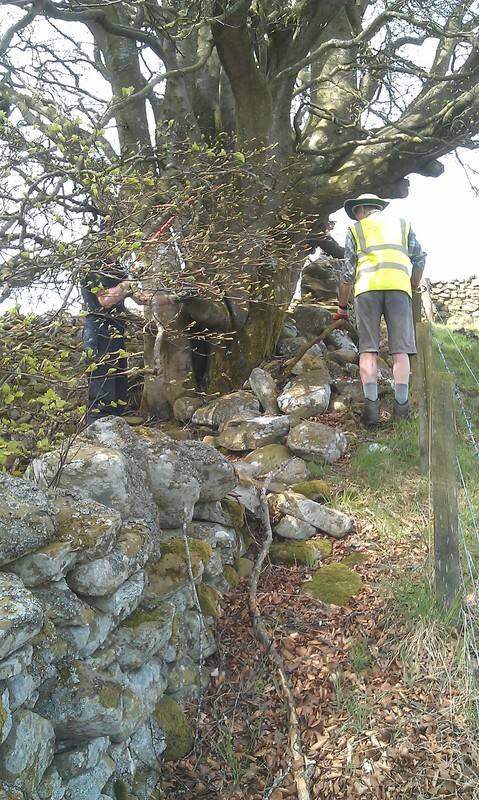 It took the best part of an hour to clear away the fallen stones and other debris, but by lunch time we were ready to start putting it back up again. 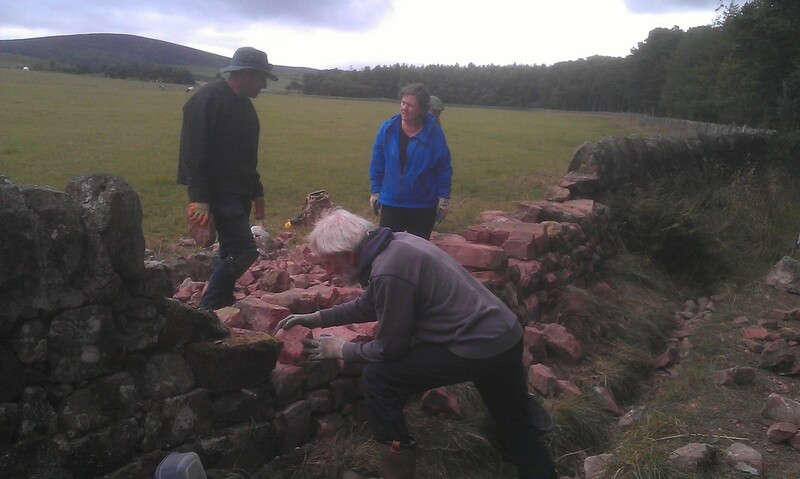 Once we'd got started the wall went up pretty quickly, and by the time we knocked off we'd got the majority of the gap rebuilt. 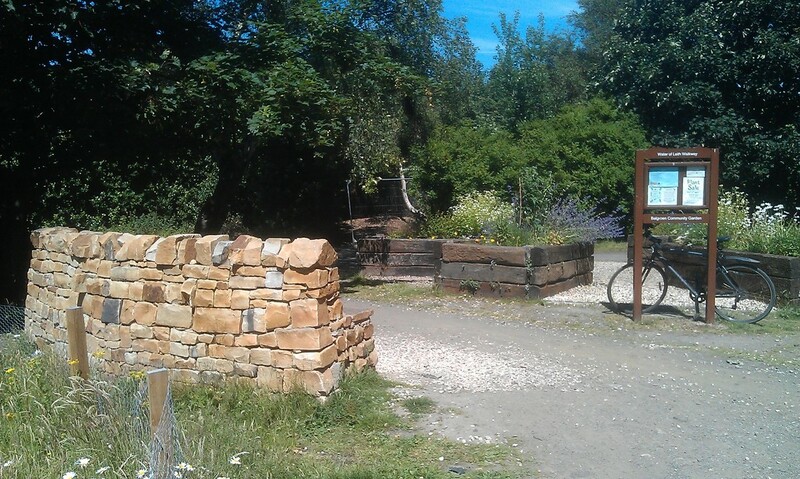 We're heading back here later in the summer, so hopefully we'll get the last little bit finished then.